We’ve made it a full year on the road! And what a year it has been! In the past year, we’ve developed and discovered our unique identity as independent travelers, not typical tourist vacationers or even backpackers. 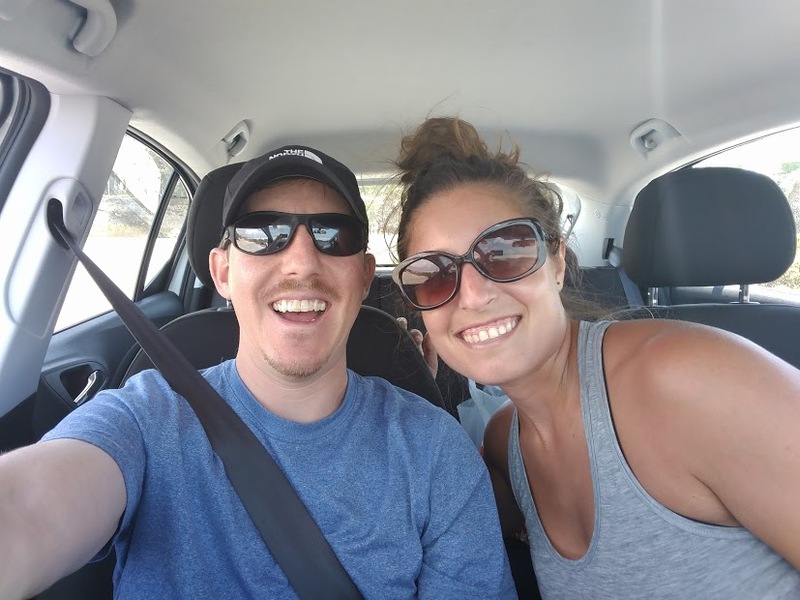 We’ve experienced so much that has changed and facilitated growth in us, both individually and together as a couple, in our time living life on the road long-term. This has easily been one of the most eventful years, if not the most eventful year, of our lives! We’ve chased authentic experiences over seeing sights and checking the boxes, and it’s rewarded us with many enriching, insightful, fulfilling experiences as a result. Our encounters aren’t always easy, but our time spent pursuing this journey has definitely been worth it — what we planned for, gave up, and put on hold back at home to take a chance on! We confidently (still) have no regrets about our decision to do this! What we’re doing didn’t just happen for us. 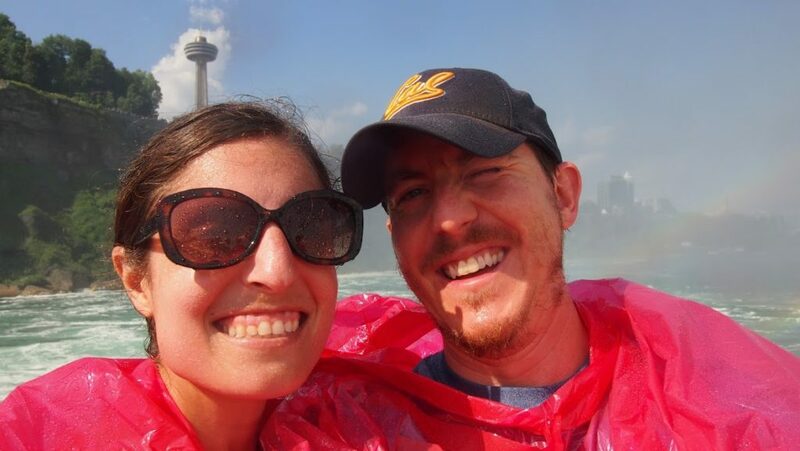 It took a lot of deliberate thought, planning, research, saving, and talking and listening to people who had done something similar (a couple of other couple friends of ours and travel podcasts, plus reading various travel blogs). It’s goes beyond the initial leap of actually leaving our stable careers, acting upon our decision to not renew our lease on our house we’d rented for the preceding four years, and downsizing and moving our stuff into storage; beyond the immunizations and preventative visits with health care providers to get our final checkups and stocking up on medications while we still had medical coverage (although not everything we needed was covered); beyond deciding on what we thought was necessary clothing and gear and packing our minimal belongings into less storage space than we’d ever lived with, that we would personally carry with us along the way; and beyond saying our goodbyes to friends and family and embarking upon the unknown by driving off in our 2007 Saturn Ion. 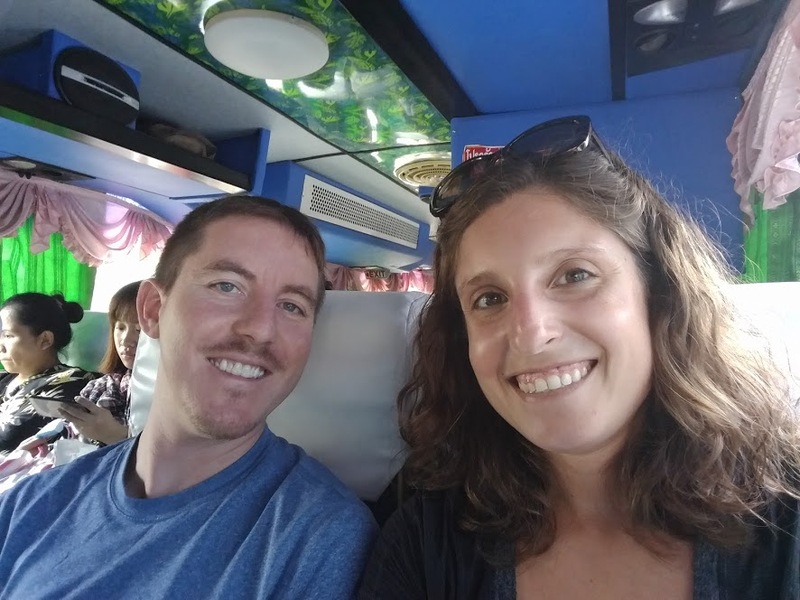 It’s also about what we did after all of that, what it actually takes to travel independently through various countries in the world for a prolonged period of time away from home. It’s not glamorous, but it’s fulfilling stuff that we both feel is worth what we gave up in exchange. When times are challenging and we muddle and push through them, we feel like we’ve earned for ourselves and appreciate more the easier, comfortable times (such as indulging in good food and specialty coffee and/or having shorter, smoother transit days) and being able to enjoy the natural beauty around us (usually picturesque landscapes and relaxing environments). While it feels like an overwhelming, daunting task to try to sum up the past year in a mere blog post, here’s my attempt to provide an overview to scratch the surface (with an especially raw and honest mind dump of my thoughts right now, as we’ve approached and surpassed this significant time milestone, to follow). The Final Chapter: Our return road trip driving back across the U.S. via the southern states (although this remains to be seen, as we could switch things up a couple of days before leaving as we did the first time)! We also spent less than 48 hours in Dubai, United Arab Emirates (UAE) in the Middle East to break up our flight travel to Athens, Greece. 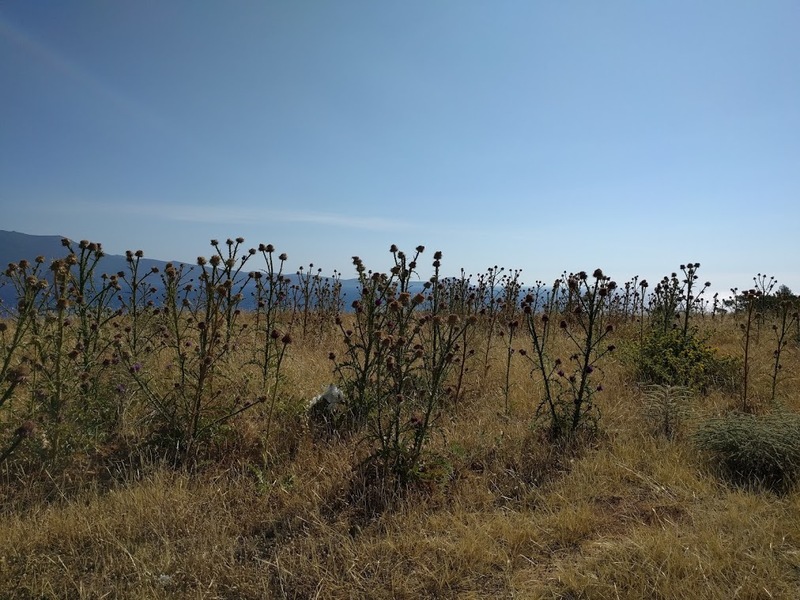 All we knew for sure as far as a higher-level overview, planning in advance, was that we’d drive our car across the U.S., spend some time in Mexico and Central America, make it to Greece by Pascha, and walk the Camino de Santiago in Spain. We had a general idea of where we wanted to go and where we thought we’d end up, but that certainly changed along the way based on how we were feeling at certain points and what we encountered. For example, we didn’t know how long we’d spend in Mexico and Central America and were hopeful to make it to at least a couple of countries in South America (we ended up needing to choose between there and Thailand based on the amount of time we had left if we were going to make our timeline goal of getting to Greece by mid-April). 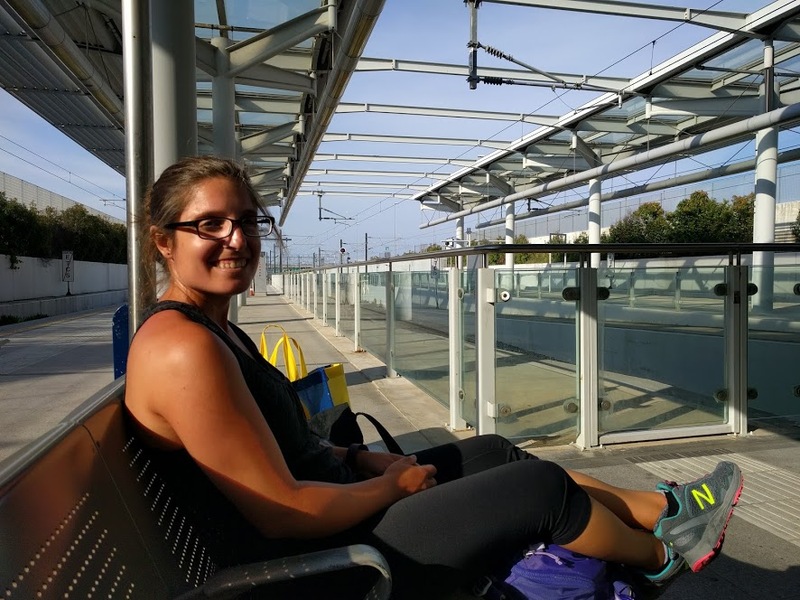 We were sure we’d spend some extended time living in and becoming more familiar with Italy, but once we found out about Schengen (we can only spend 90 days within a 180-day rolling period in EU countries that are a part of that agreement), we had to choose our route based on making the Camino fit within that timeframe. 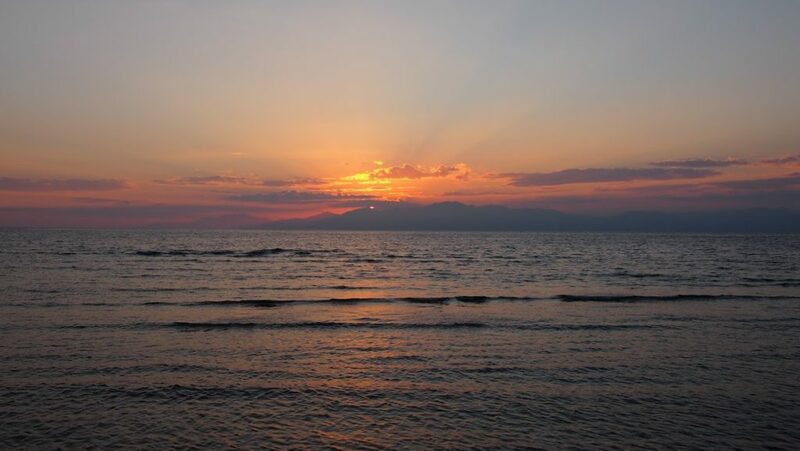 Instead, we ended up in Cyprus and the UK, places we hadn’t planned on going (but are happy with how it worked out). 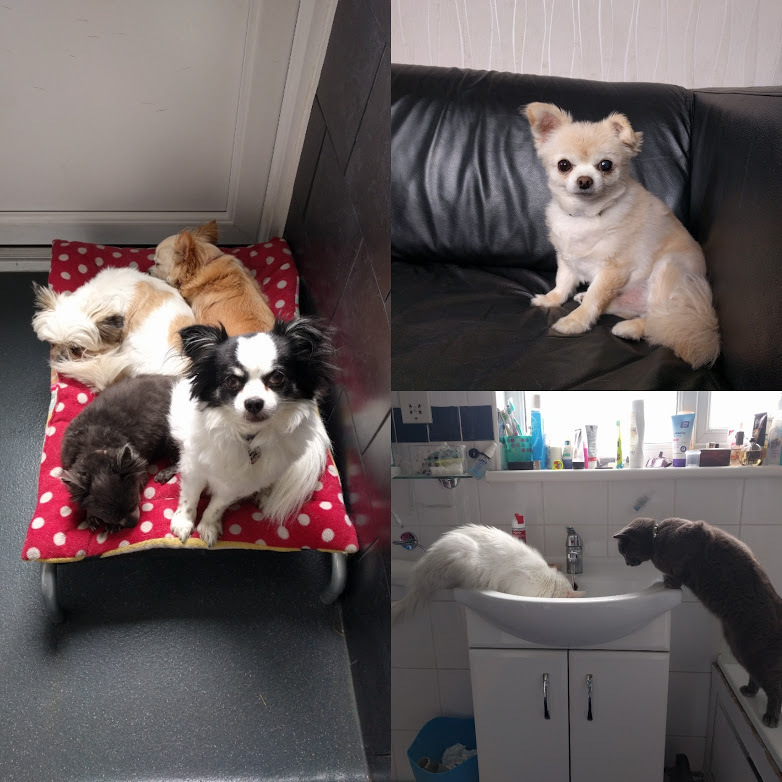 We had heard of house and pet-sitting as a way to save on accommodation expenses while traveling before leaving, and we held onto that thought as a possibility to revisit and look further into later down the road in our journey. Six dogs and four cats later, it’s been not only a huge means of enabling us to travel in some areas that are generally on the pricier side, especially during the times of year we went, but has warmed our hearts, made us feel more at home for extended periods of time, truly gave us a feel for what it’s like to live as locals, and is one of most memorable and personally rewarding experiences of our travels! So far, we’ve spent time in 17 countries on three continents. 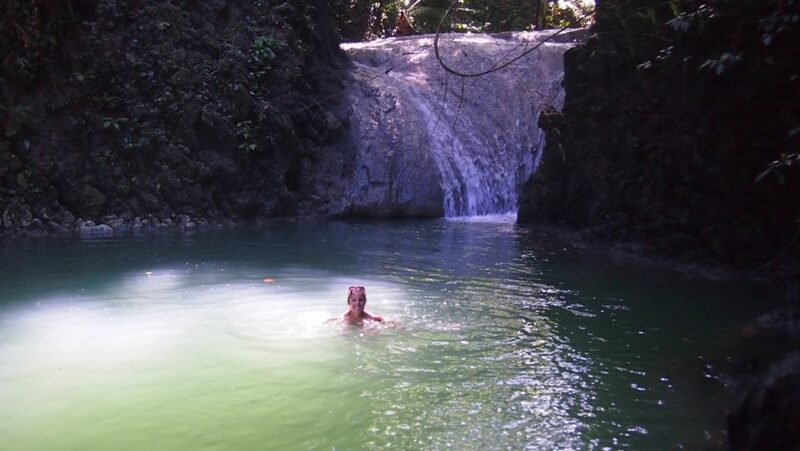 We’ve experienced big cities, small towns, rural villages (referred to as pueblos in Spanish and χωριá in Greek), mountains, volcanos, beaches (white sand, black sand, rocky), lakes (salt and fresh water), rivers, waterfalls, natural springs, ruins, heat (humid and dry), cold, rain, flooding, and thunderstorms. 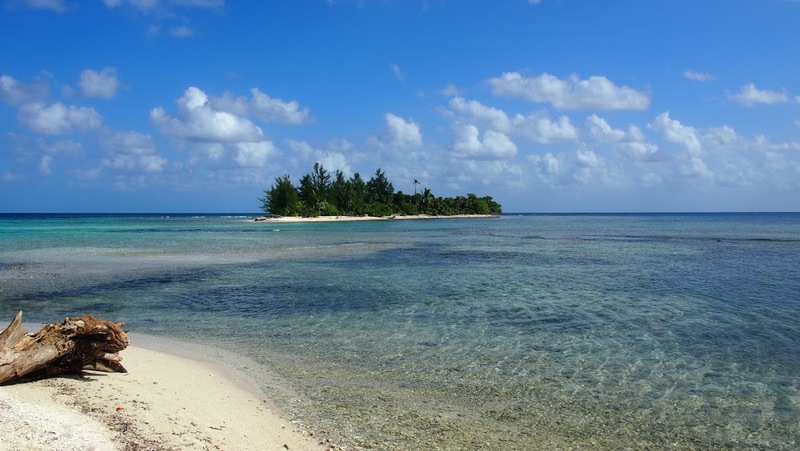 We’ve witnessed dozens of sunrises and sunsets in picturesque settings, one of the most striking and memorable on a semi-private island in Cayos Cochinos, Honduras. We’ve found ourselves most attracted to larger cities when relying on public transport and our feet to get us around, to be close enough vicinity to (likely) be able to find what we need and access areas we’re interested in exploring inter and intra-city, but we’ve made it work in more rural environments as well (for example, renting mountain bikes while staying on a remote property near Monemvasia in the Lakonia region of the Peloponnese in Greece to be able to get to nearby villages for groceries, coffee, and occasional dining out and exploring). 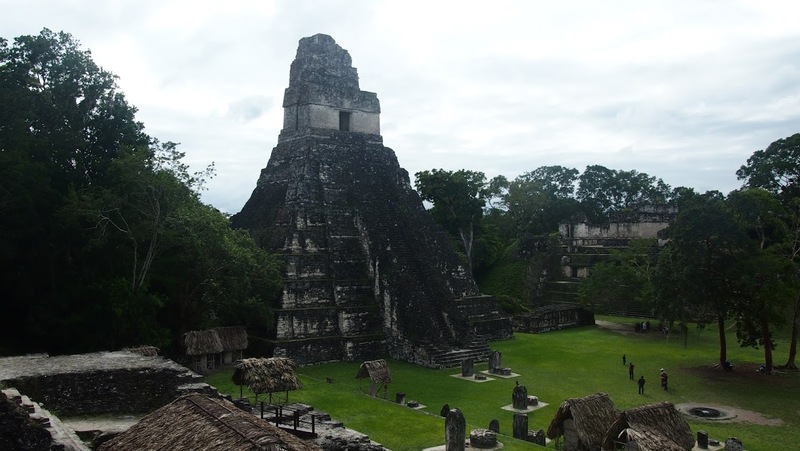 Tikal (Guatemala), which exists in the midst of la jungla (the jungle)! We spotted some neat wildlife while exploring the many ruins structures here, too! 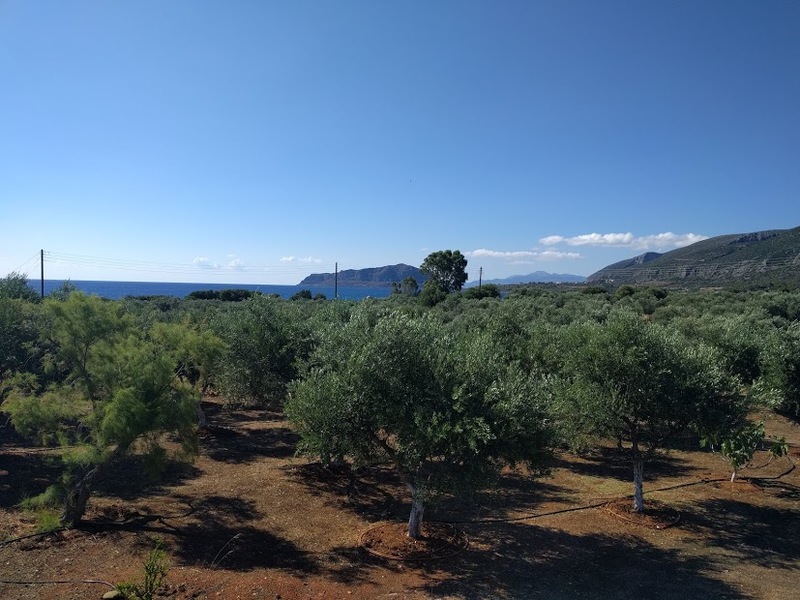 Returning from a day in Monemvasia with groceries, a sweaty mess after quite the workout in the heat of the day, but beautiful scenery along the way and a challenge overcome! We’ve experienced varying degrees of infrastructure in our travels. 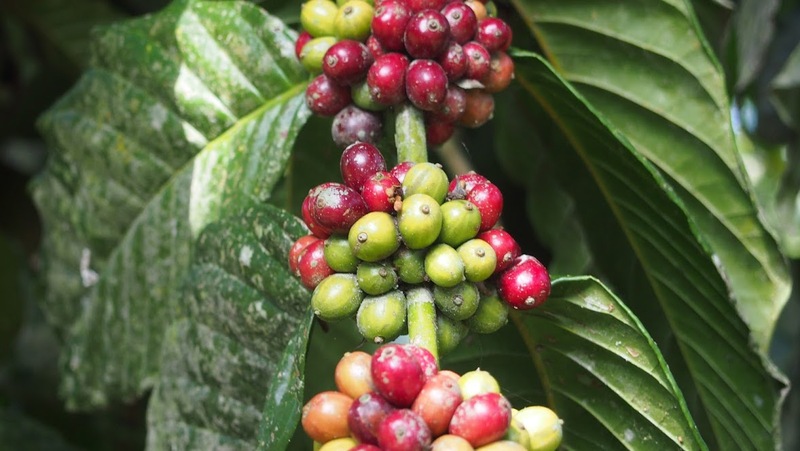 The best is in the US, UK, Germany, and Cyprus, followed by Greece; mid-range in parts of Thailand, Mexico, Honduras, Nicaragua, and Costa Rica; and the most difficult to navigate is Guatemala. Black clouds of exhaust polluting the air and enveloping our bodies when a bus releases it onto us when passing by; the large amount of trash piled up and scattered on the streets (and being burned as a common means of disposal); poor (or lack of) street name signage; rocky, unpaved roads with potholes sporadically; uneven and narrow sidewalks (or no sidewalks); lack of discernible traffic rules (and safe, designated methods for pedestrians to cross the streets); and shenanigans at border crossings have been common encounters to contend with throughout our travels. After experiencing these situations, we have a newfound appreciation for smoothly paved roads, pedestrian crosswalks with a timed signal, enforced emissions standards, a modern and reliable sanitation system, and a sewage system that can handle our toilet paper being flushed down into it. These are all things that are easy to take for granted and assume are givens, based on our experience living where we do in the US anyway, but I assure you they are not. These days, we’re living pretty comfortably in the UK with the personal knowledge of how fortunate we are to have all of these amenities again after learning what it’s like to live without them for periods of time. 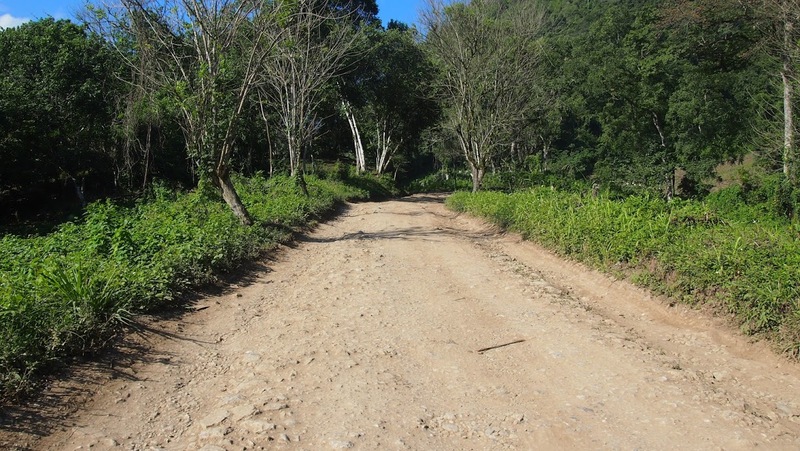 The road from Lanquin (the nearest town) to Semuc Champey – About 45 minutes in the back of a pickup truck surrounded by other people steadying themselves beside you! The greatest timezone difference we’ve lived in from Pacific Standard Time in California is 10 hours ahead while in Thailand. We’ve traveled by foot, bus (what would be described in the US as charter and old school buses, and double-decker), transit van, steadying ourselves and holding on in the back of a pickup truck, collectivo, tuk-tuk, rental car, taxi, Uber, train, plane, subway, tram, kayak, lancha, and ferry boat. Our longest overland travel day was over 17 hours (La Ceiba, Honduras, to Leon, Nicaragua, leaving after 9:00 a.m. and arriving around 2:30 a.m. the next day). Our longest air travel day was 21 hours (from Los Angeles, CA, to Bangkok, Thailand, with a layover in Taipei, Taiwan, leaving at midnight and arriving the following day at noon). We’ve endured late arrivals and delays, underdeveloped or damaged roads that haven’t been repaired, uncomfortable seats, limited personal space, stiff and sore bodies, pain from being jolted and bumped around, the absence of seatbelts, eating snacks to curb our hunger for or take the place of meals, crazy drivers, lack of air conditioning while packed into an old transit van to capacity (seats that folded down into the aisle space, too) on a hot and sunny day, unpredictable timing of rest breaks for food and/or a toilet, unexpected stops, overcharges and bogus fees, getting soaked with splashing water while in-transit (while on lanchas), and the most memorable — walking through flooding thigh-high, clothed, while carrying all of our belongings. We’ve especially appreciated when we’ve had access to public transit that is well-connected, modernized, and generally reliable, such as the bus and trains systems within the London area, the subway system in Munich, or the bus system connecting cities in Mexico, as we’ve certainly had our share of figuring out how to get where we needed to go creatively (Rome2Rio has been a great help as a preliminary step from one destination to the next when traveling overland, and we’ve relied on independent traveler blogs, too). Navigating within places has been a challenge for me (Aaron is a natural navigator, which is to my benefit but also upsets me because it comes so easy for him while I often have to stumble my way through it, and make a point to remind him to just follow me with patience unless I ask for his help, even if he knows I’m going in the opposite direction — this is going rather well these days), but I have felt much satisfaction when I’ve figured things out on my own, with a hard-copy map in place of a navigation app, or just my own recollection if it’s somewhere I’ve been before and am a bit familiar with, in addition to when I’ve had a phone to help me out. 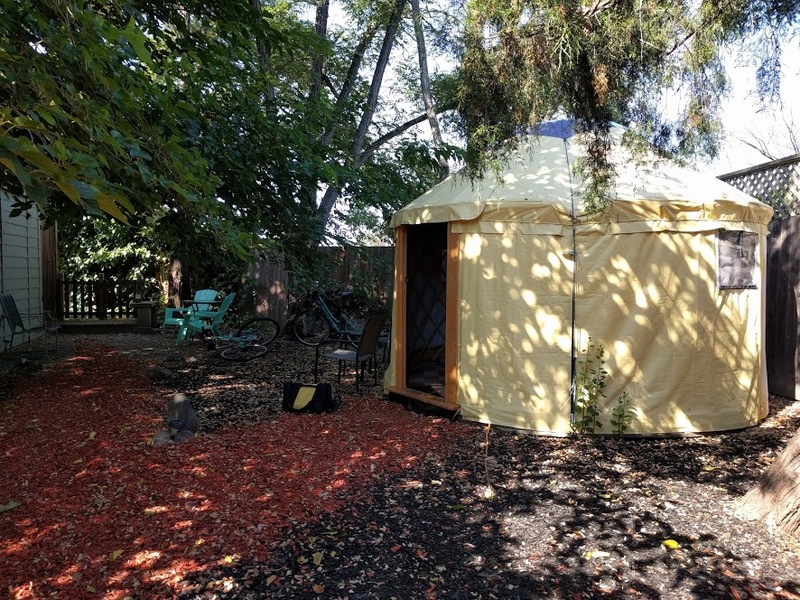 We’ve stayed in a tent on campgrounds, a yurt in a backyard, a farm house, a fully furnished basement, guest houses, a loft, a beach bungalow, high rise apartment buildings, (occasionally) hotels, private rooms with shared bathrooms and kitchens (mostly through AirBnB but also through hostels — most commonly found via Hostelworld and Booking), studio and one-bedroom apartments, an English language school, a volunteer accommodation. We’ve even stayed in a room filled with spiders and insects (dead and alive! 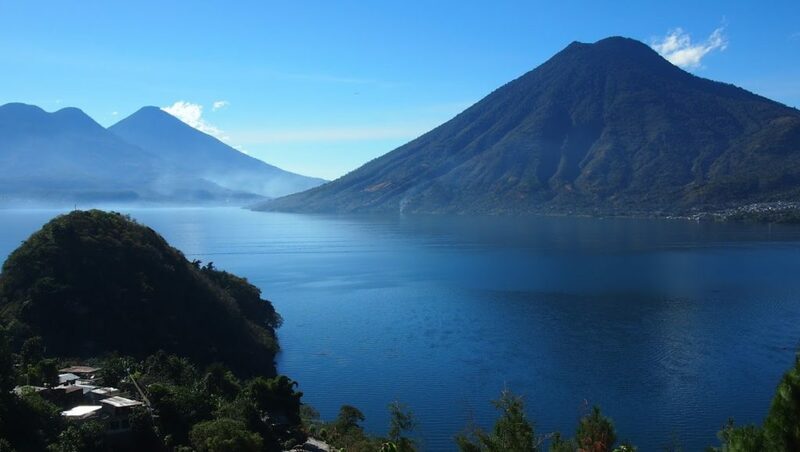 ), where satanic techno music blared just outside its walls, jolted us awake, and kept us up as it sporadically continued for over two hours in the middle of the night (ahh, yes, we’ll never forget our grand finale to our time in San Marcos on Lago de Atitlan in Guatemala)! Thanks to Trusted Housesitters and HelpX, we’ve lived in the comfortable homes of locals while they’ve been away on vacation (or “on holiday” as they refer to it in the UK), watching their property and caring for their beloved pets; we’ve befriended ten sweet doggies and kitties whom we are all fond of [yes, even having had our share of regularly cleaning up piddle and poop (the doggies) and managing each of their distinct personalities and desires for constant attention, when it comes down to it, they are all just so irresistibly lovable]! 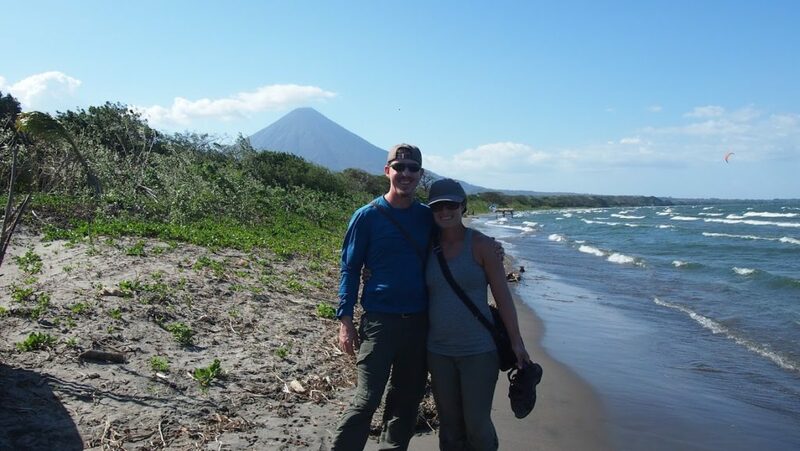 We’ve experienced living in an indigenous Mayan family’s home near, but removed from, the small town of Punta Gorda, Belize; a Guatemalan family’s house in the renowned city of Antigua; and a Nicaraguan family’s home on Isla de Ometepe in the community of Puesta del Sol in La Paloma. These experiences were certainly a part of our language and/or cultural immersion, too! 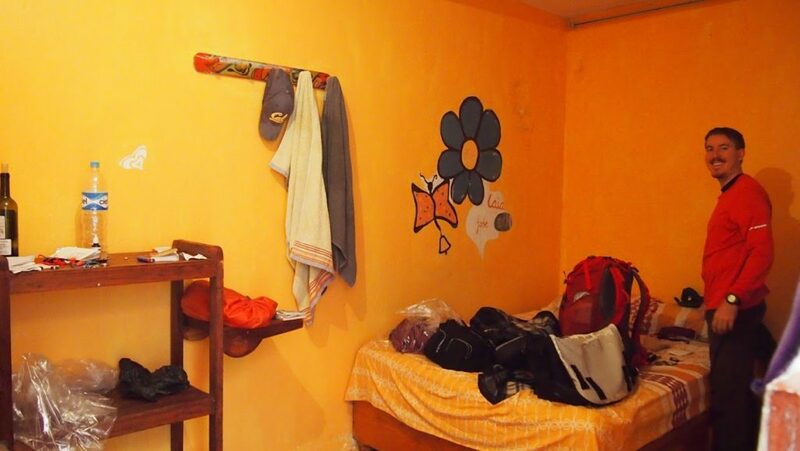 Unexpected upgrade to a beautiful, modern, private room on Rio Dulce (Guatemala) when really had recently had some rough experiences and fully appreciated it! 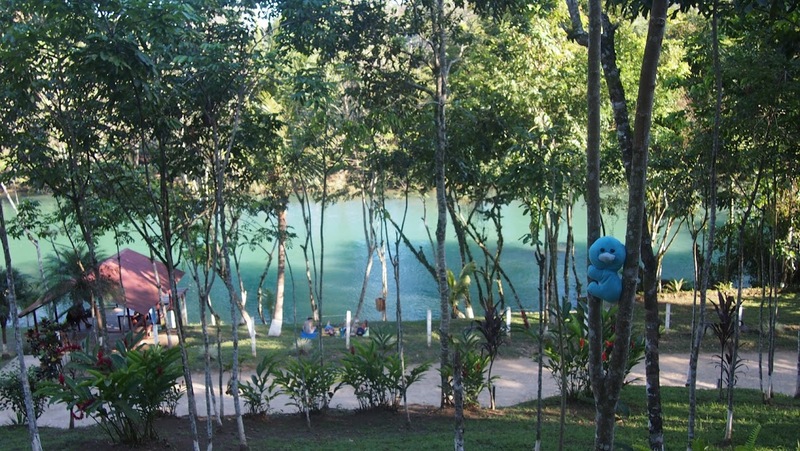 We’ve dealt without air conditioning in hot, humid climates (such as in Thailand) and without heating in colder ones (such as San Cristobal de las Casas, Chiapas, Mexico). Aside from our more lengthy stays (typically a week or longer), we’ve primarily lived in very basic accommodations, typically a room with a bed (not always with a fitted sheet, sometimes with only a blanket, a sheet, or a comforter — other times a combination of these items) and a table or desk to put things on, but that’s about it. For a long while, warm or hot water was a rare luxury to come across; thankfully, most places without heated water were in warmer climates, so it wasn’t essential and sometimes undesired anyway (although I prefer it for washing dishes regardless of the weather), but showering in cold water (there are varying degrees, of course) certainly can be a shock to the system and miserable to try to acclimate to and come to expect as the norm. I’ve worn my Tevas in the shower on plenty of occasions, when sharing bathroom accommodations at hostels and on campgrounds, and depending on how clean I feel the floor is (when it’s shared, the drain is clogged, and the water is rising, I’m wearing them for sure). 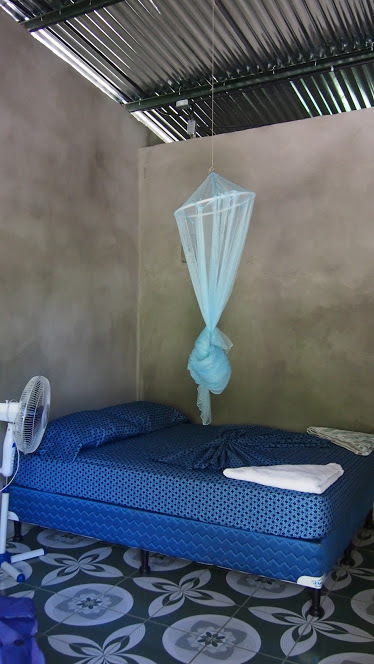 We contended with mosquitos fairly regularly in Mexico, Central America, and Thailand, which were also places where we stayed in accommodations at times that weren’t completely sealed off from the outdoors; screens on windows aren’t common, there may be spacing between where the ceiling and the walls meet, and mosquito nets aren’t always provided. 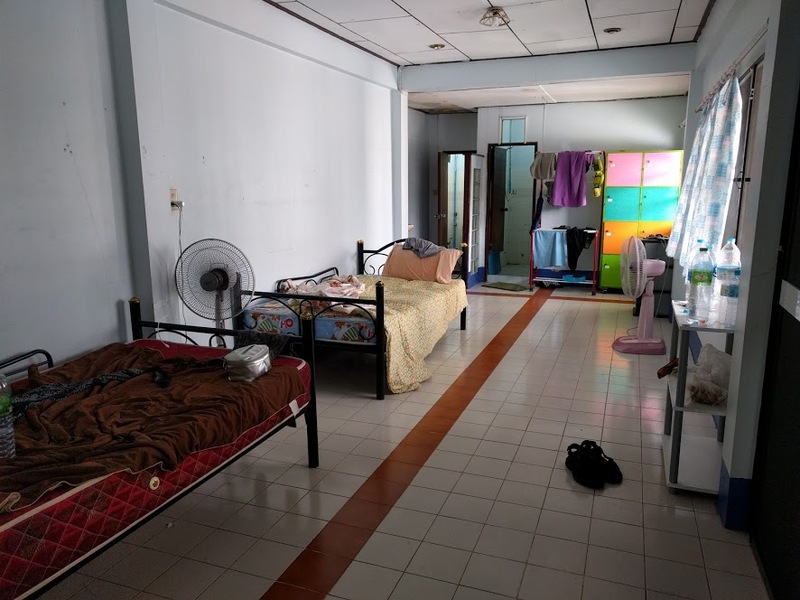 Specifically in our volunteer accommodation in Trat, Thailand, the doors to our room (which opened up into an outdoor staircase leading to a patio) had spacing between them and the sliding screen door didn’t close all the way; we didn’t have a mosquito net, so I did my best to stay under my shawl, which served as my sheet, at night and kept the floor fan aimed directly on me (as a potential deterrent). (Discovering Tiger balm was such a relief for coping with my bites, as well as using Citronella spray as a natural preventative measure in place of the DEET, which has a smell I find to be pleasant, although probably is a bit less effective)! Needless to say, having an clean accommodation with a modern look and feel, access to hot water, a comfortable bed, a well-equipped kitchen, ample space to hang out beyond sitting up or laying down in bed, completely closed off from the outdoors, and privacy are all things we’ve noticed and enjoyed tremendously after going without them for periods of time. 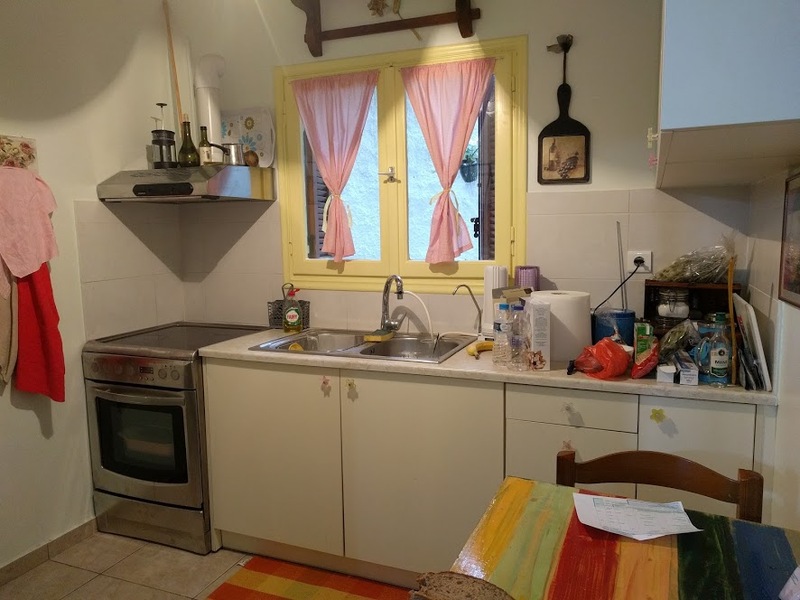 We also feel like we’re heartier travelers as a result of some of these experiences, being able to deal with a pretty basic standard of accommodation (I suppose we’re Camino ready for the shared dorm rooms and bathrooms now)! We’ve both become more conversational in Spanish and I’ve grown in my Greek language comprehension and speaking abilities. We spent close to a month living in an apartment within short walking distance to our Spanish school, SISAI, in Quetzaltenango (Xela), Guatemala, where we had one-on-one instruction for up to 25 hours per week plus opportunities to learn more about Guatemalan culture through in-class presentations and discussions and organized activities outside of our language lessons. 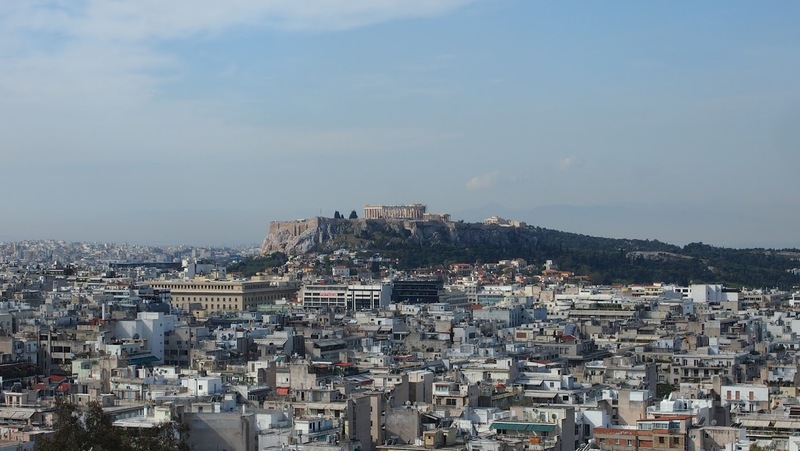 I attended Greek language classes at Lexi-Logos Greek Language School in Athens for the month we lived in a studio apartment there, putting in hours of studying in my own time outside of the small group lessons twice per week for a couple of hours each session. 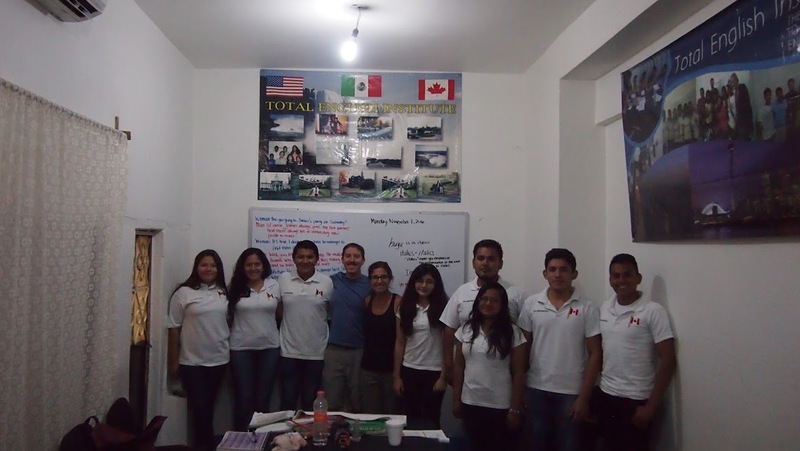 We’ve assisted in teaching English in the small communities of Tehuantepec, Oaxaca, Mexico and Trat, Thailand, for one week each, both places we never would have known about or visited had it not been for finding them on HelpX and making arrangements with our hosts to go. 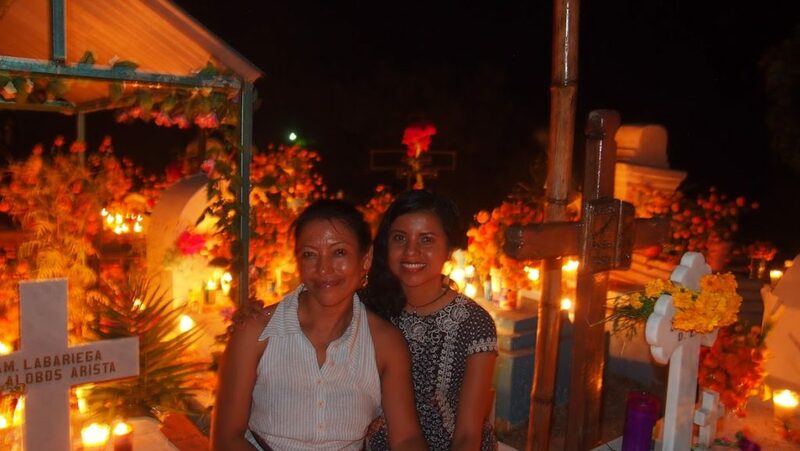 We’ve celebrated Dia de los Muertos in Santa Maria, Oaxaca, Mexico; La Quema del Diablo and Dia de la Virgin de Guadalupe in Xela, Guatemala; Navidad and Año Nuevo in Antigua, Guatemala; Independence Day in Trat, Thailand; Pascha in Athens, Greece, and our birthdays in Pentakomo, Cyprus, and London, England (UK). We’ve lived in countries where the predominant religion practiced by its people is Catholic, Buddhist, Islam, Orthodox, and Protestant. 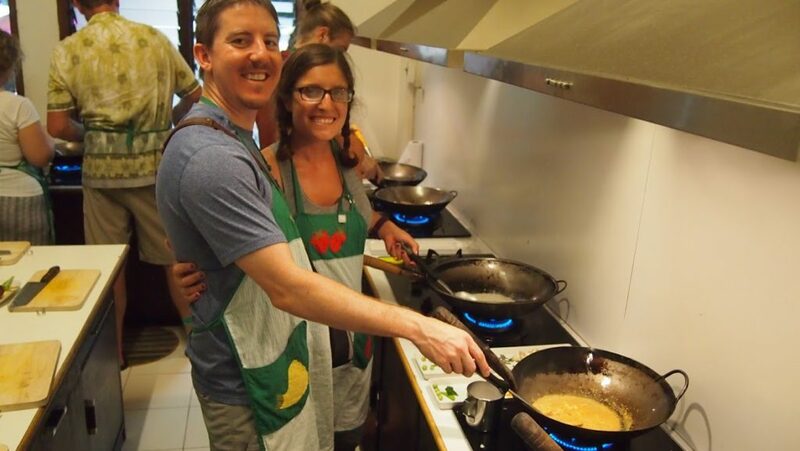 We’ve learned how to make a variety of traditional Mexican, Thai, Greek, and Brittish dishes that we’ll bring home to our own kitchen in California. 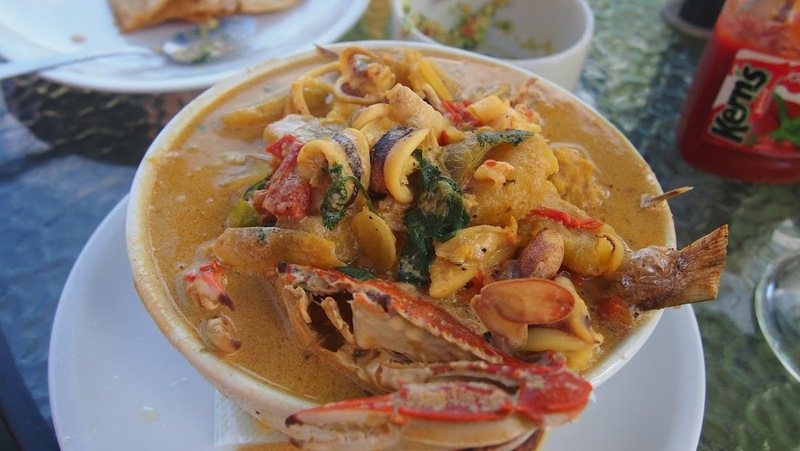 We took cooking classes in Oaxaca City, Mexico, Chiang Mai, Thailand, and Livingston, Guatemala (to learn to make a Garifuna seafood stew, tapado). 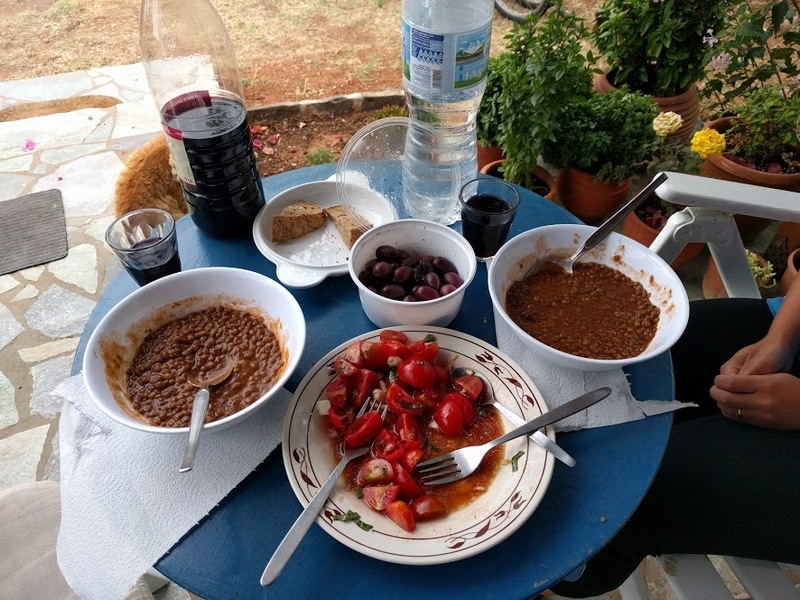 Specifically in Athens, procuring local ingredients (including at our neighborhood Saturday street market) to produce involved, authentic cuisine was something we indulged in and love to reminisce about. We’ve learned about local conflicts, witnessed protests, and taken an interest in knowing why things are the way they are and what locals feel and perceive. (Aaron has taken it upon himself to read at least one book about each country we spend a significant amount of time in). 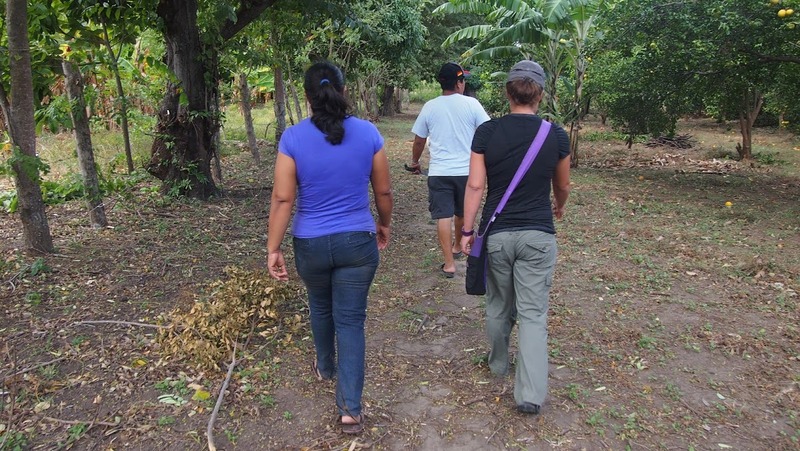 We’ve been culturally receptive and respectful throughout our travels, regardless of the country we are in. 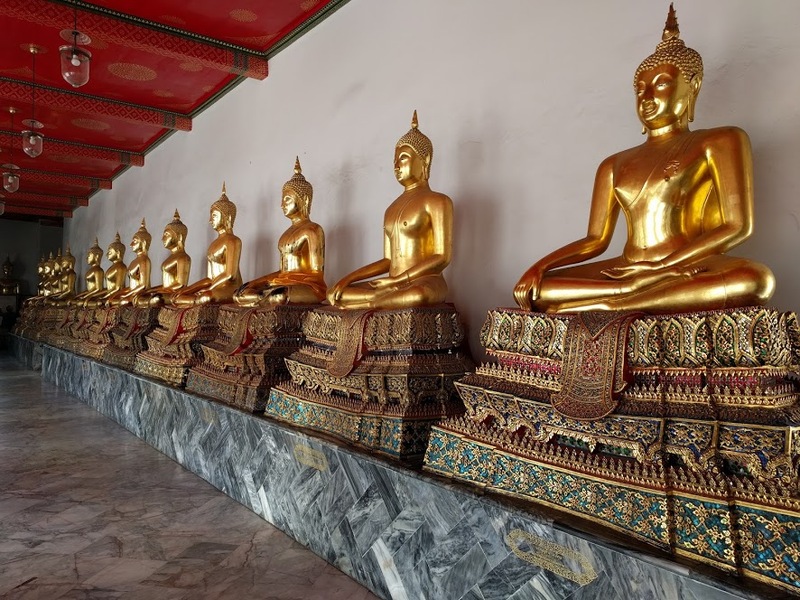 Since there are more subtle differences in American and British language and culture than there are, say, in American and Thai culture, we feel the degree of our fulfillment in this area hasn’t been as prominent at this point in our travels, but it’s certainly still notable and interesting to pick up on. After living in countries for months at a time where English wasn’t the primary language spoken, and especially when being focused on learning and practicing the local language on a daily basis and not being fluent, it’s felt nice to have a break from it, where the element of communicating is not a daily challenge to face and overcome and the whole language piece is easy again. That constant pressure, uncertainty, and at times, embarrassment, has vanished, but at the same time, I also feel like I’ve lost the opportunity for learning and growing with my developing language skills in the unique way that living in a place where people primarily speak the language I’m learning offers. And I find myself missing this element of our travels (Aaron does, too). Again, I suppose it’s good timing for heading to Spain soon [although admittedly, I am a bit nervous mixed with excited — nervous because I speak Mexican and Central American Spanish, not Spanish from Spain (there are differences in pronunciation, words, and verb conjugations with a whole additional form, vosotros) — and excited to be able to use what I know and practice again, hopefully growing more in my abilities]. 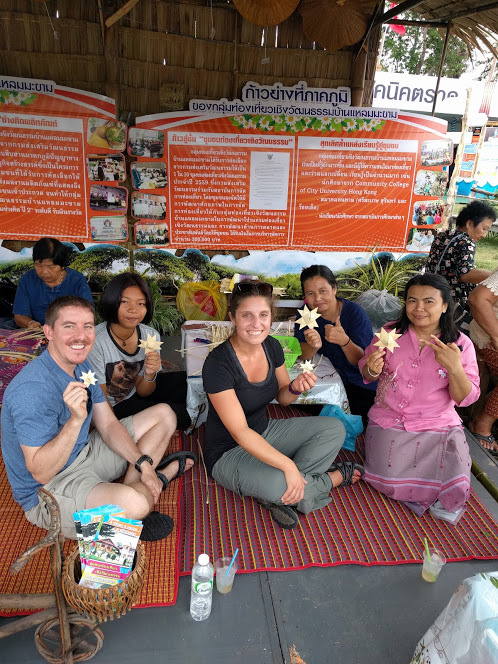 We learned how to make a craft at the Trat Independence Day celebration! I’ve experienced chronic diarrhea (the kind that is difficult, and at times impossible, to control); the common cold; a sprained ankle; two intestinal infections (which manifested themselves by giving me an increasingly swollen and painful belly, diarrhea, and the first time, vomit); yeast infections; fatigue; mosquito bites; and homesickness. Aaron has dealt with some of these issues, but fortunately for him, not as many or as often. I’ve developed some noticeable skin damage from being over-sunned, especially on my nose, cheeks, shoulders, and chest where I get the most exposure. (Cosmetically, I now look like I have a bit of permanent bronzer brushed onto my cheekbones, which I suppose is a positive twist to spin on it, and my nose is a bit rosey, but I’m hopeful these things will fade a bit with time and not become health concerns). We’ve become familiar with at least 12 different currencies. We’re maintaining about $10 per day under our daily spend goal and are significantly under our overall budget for our long-term travel journey, which has afforded us the ability to make the decision to travel beyond the one-year timeframe we initially set for ourselves (otherwise there would be no Camino de Santiago for us due to Schengen time limitations in certain EU countries, which we discovered while on the road and shifted our plans accordingly). We’ve learned how to “travel hack“, or how to spend less money while traveling, namely through preparing our own food when we can (i.e. limiting the frequency we dine out), traveling slower and staying longer in places for weekly and monthly discounts on accommodations via AirBnB, volunteering and house and pet-sitting through HelpX and Trusted Housesitters in exchange for free accommodations, limiting time spent in touristy areas and on tourist attractions and instead finding local neighborhoods and lesser-known favorites, and taking advantage of miles earned through dollars spent on specific credit cards, such as Chase Sapphire Preferred and the Capital One Venture Card (we’ve saved over $3,700 in flight expenses to date because of the bonus miles we earned from meeting each of their minimum spend requirements)! We’ve cleaned our clothing in kitchen sinks, washing machine units installed in kitchens, and bathtubs; we’ve done our laundry ourselves at laundromats and dropped them off for washing and drying services at lavanderias. 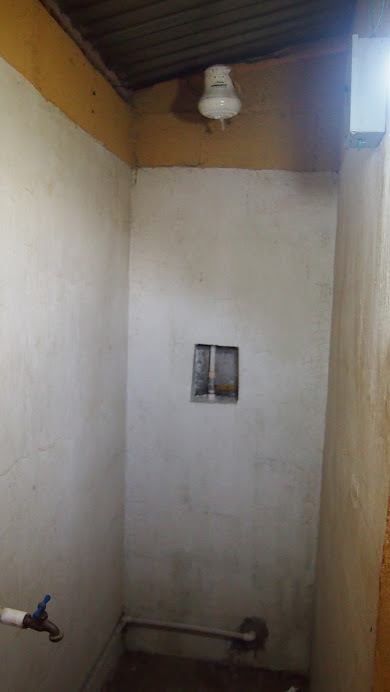 (Drying is primarily achieved through hang-drying on clotheslines outside of the U.S., in our experience, but from time-to-time, we have come across dryer machines). 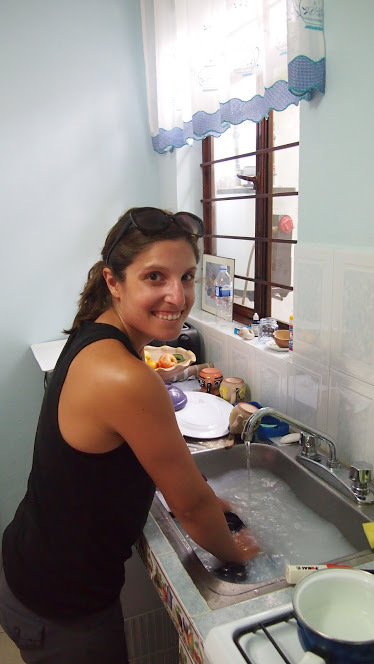 Washing my clothing in Oaxaca City! We encounter the unexpected, are forced outside of our comfort zones, and transition from degrees of comfort to discomfort frequently. I am sweaty pretty much anytime I walk around outside; it’s just a matter of how much sweat depending on the weather conditions, what I’m wearing, and to the extent I’m exerting myself for a certain period of time. (It helps me to remind myself that I will be able to shower and feel clean again later that day or evening, and to know I’ll be able to wash my soaked clothing soon). Aside from transit days, we go to bed and wake up as we please (although there’s often something motivating me to want to rise early, like working out in a class or trying to get ahead of a potential crowd somewhere). We choose what to do with our time (although we’ve had quite the struggle to get to the place we have fairly recently where we’re both feeling like we’re sharing equally in the decision-making of where to go and what to do when we’re exploring and navigating together — it’s a continuous work in progress, but it’s generally going well these days and we work through it). 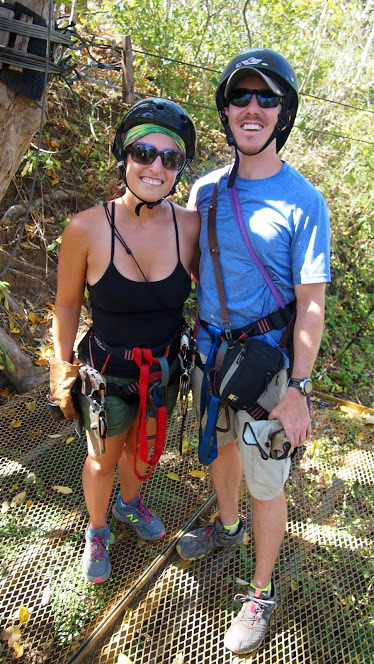 We have had time to ourselves individually, but we’ve also gone through periods of time where we hadn’t regularly (mostly based on perceived level of safety and comfort in doing so where we were staying). We both find it super important to each have alone time to do whatever it is we want without having to consult with the other person. It’s refreshingly healthy for our personal well-being and for our relationship, too. We’ve been served many of dishes of food not knowing exactly what it is or what’s in it at the time of eating it. 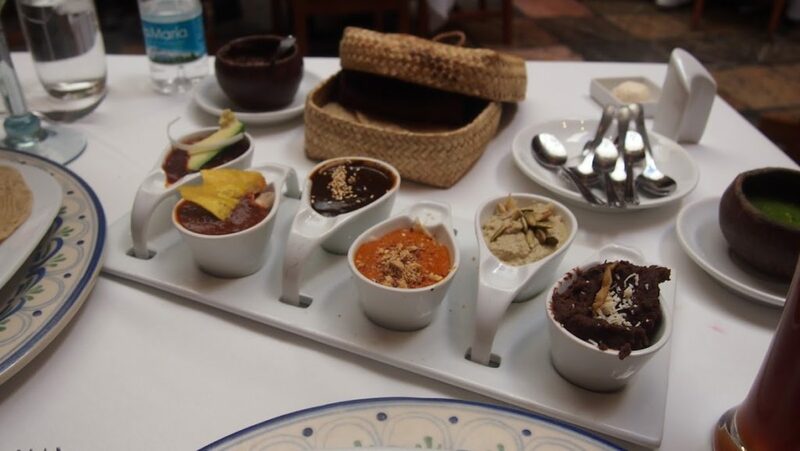 This has enabled us to try new things we normally wouldn’t and experience a culture through their culinary arts. 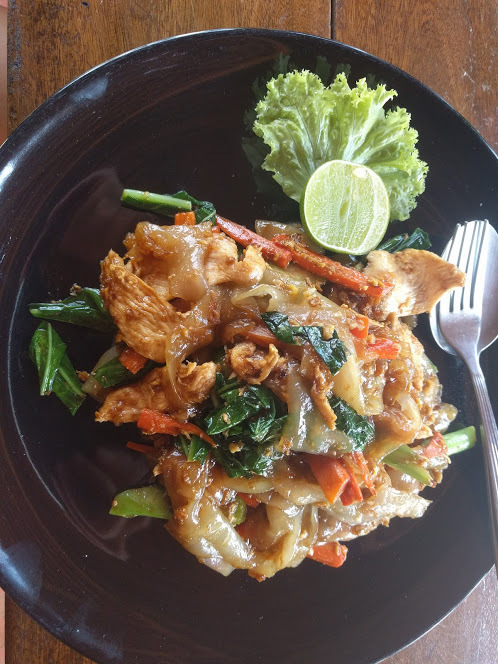 In places where eating together and sharing dishes family-style is a communal activity, such as in Thailand, we felt it would have been rude to refuse to eat something, so we just went with it to build a connection. 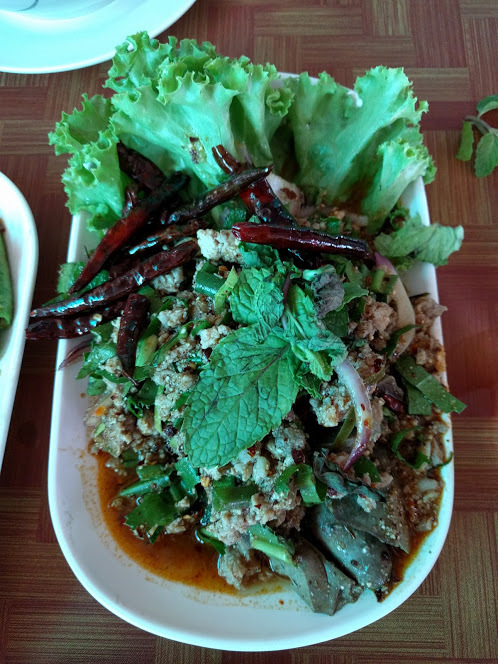 Sometimes the food was very spicy, my eyes would water, and I would need to blow my nose constantly since it would run like a faucet, but I would still eat it. Often times I noticed I liked the taste under the extreme (seemingly to me) spice level. Aaron, on the other hand, has a very high spice-level tolerance, so he did not struggle with this aspect of eating in Thailand and instead loved every minute of it! We realized that when our host would dine out with us, taking us to a place and ordering for the table, she’d often expose us to Thai cuisine we didn’t even know about, as well as places we would never have known what to order or been able to communicate much (since we don’t speak Thai beyond a handful or two of words and they didn’t speak English). 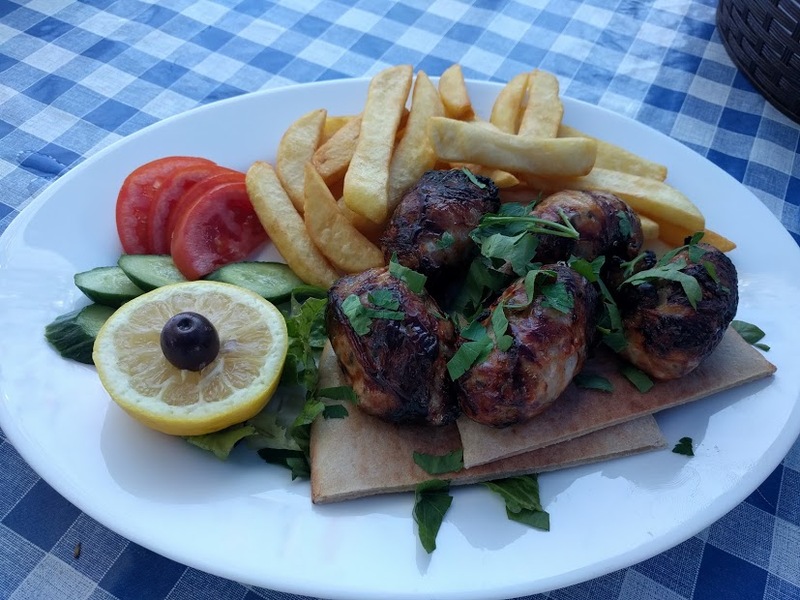 In general, we experienced our foodie highlights in Mexico, Thailand, Greece, and believe it or not, the UK! (This last one is because there is a wide range of culturally diverse, trendy food in the larger cities, similar to how it is in the US). 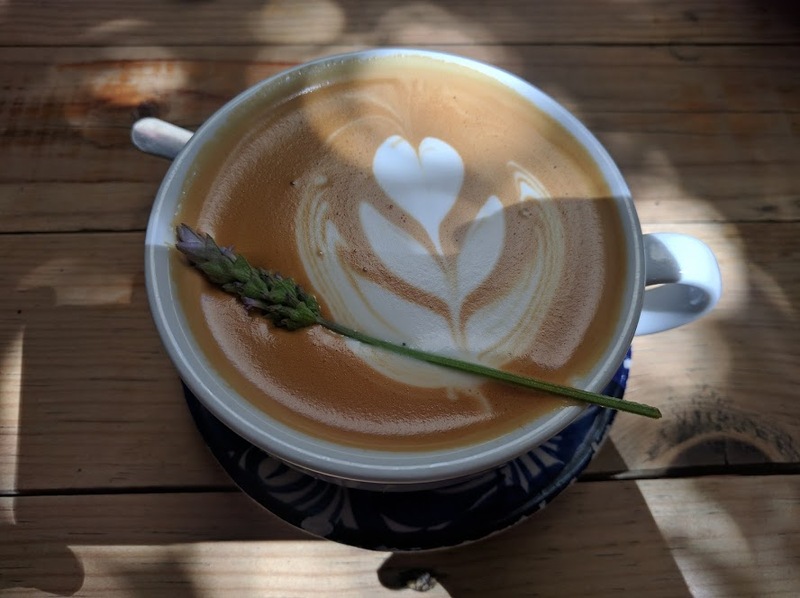 On a related note, I’ve been pleasantly surprised to find such an array of specialty coffee throughout our travels, most notably in Chiang Mai (Thailand) and London (UK), but I also drank some hand-crafted lattes in San Miguel de Allende (Mexico), Oaxaca City (Mexico), and Athens (Greece), for example. On the flip side, food lowlights are typically whenever we find ourselves in the midst of what we call a “food desert”, where there are very limited options to choose from and they usually aren’t good (for example, fast food, chain restaurants, or street food in the developing world; few shops with a very limited selection and no larger grocery store in an accessible area to us). One of our most memorable food lowlights is the random hodge-podge of whatever we could find while walking around town and stopping in small shops in Livingston, Guatemala, which turned out to be refried black beans straight out of cans with hot sauce, avocado, and tostada shells for dinner (after a couple meals like this, I refused to eat it anymore and opted for fresh fruit with sugary yogurt and granola instead, which was also our breakfast). 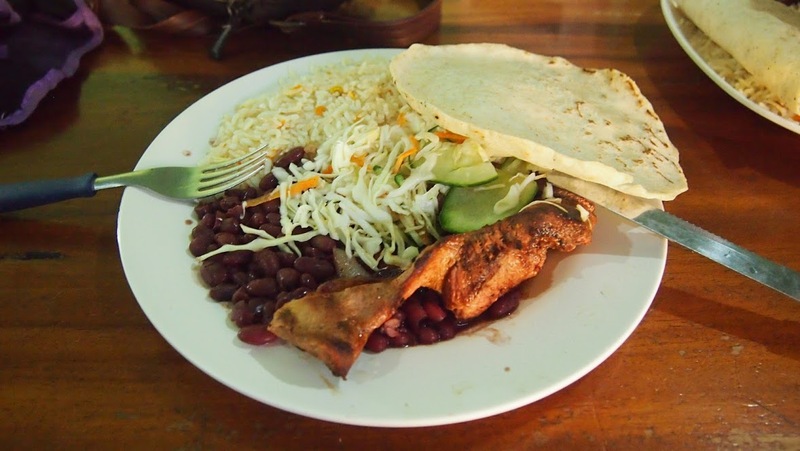 Another thought that comes to mind is that it was enjoyable at times, but also trying as time went on, to eat slight variations of rice, beans, and a meat main for most meals as we made our way through Guatemala, Belize, Honduras, Nicaragua, and Costa Rica. Certainly we ate some of our cheapest meals consisting of this combination, but it wore on us. 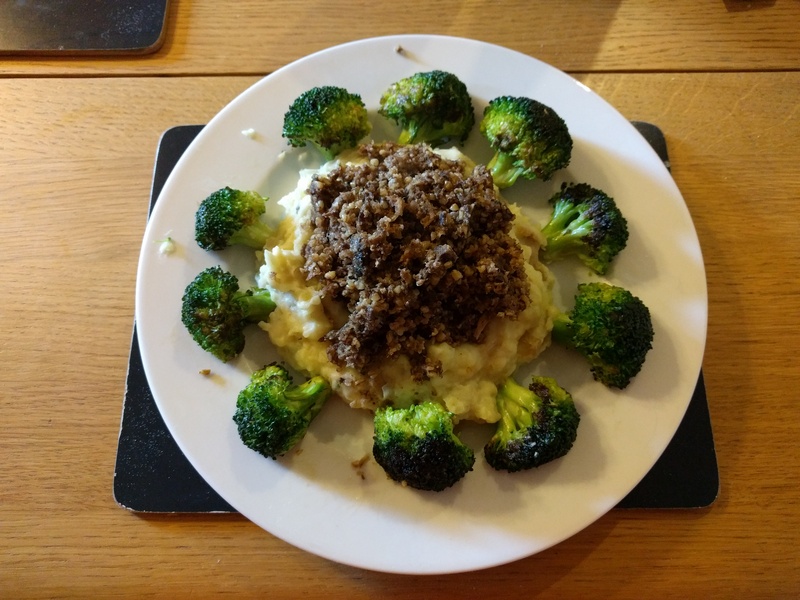 I recall moments where I insisted to Aaron that I just couldn’t do it for another consecutive meal and demanded we seek out something else instead. 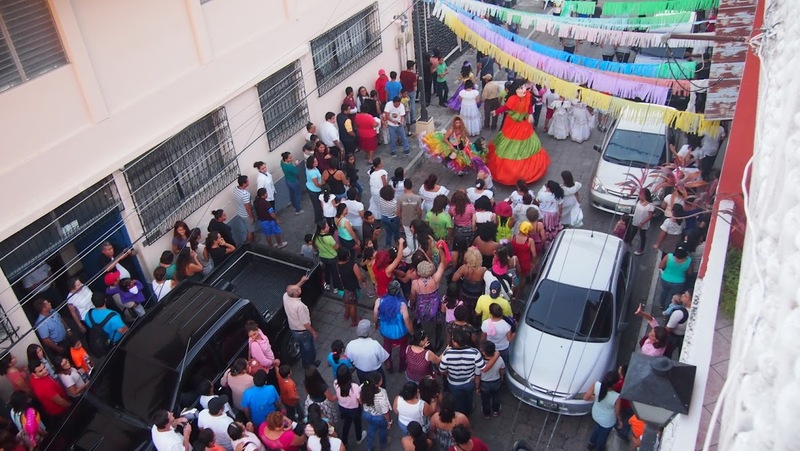 We’ve been awakened by the sounds of roosters in the early morning hours, been drawn to the sounds of reggaeton music playing on the streets (most often blaring out of electronics and appliance stores), and gone to bed hearing random fireworks go off. We’ve also fallen asleep to the the sound of the ocean waves and in peace and quiet and woken up to the crisp chirping of birds. We each have less than a week’s worth of clothing with us in carry-on sized backpacks (which although minimalist, I still have too much stuff with me and am actually looking forward to downsizing even more and carrying minimal weight on my back on the Camino — we’re going to be shipping a majority of our belongings home before we start it). We’ve learned to live without a smart phone for months (most of our time in Mexico, starting in October 2016, and our entire time in Central America through the end of February this year) and have minimal access to WIFI (also during the timeframe I just mentioned, usually spotty connections, just enough to email our family to let them know where we were and that we were okay, finalize upcoming travel reservations and logistics, and maybe have a small dosage of social media) for days at a time. This, actually, helped me grow in my abilities to navigate as well as break my relationship with being connected through social media, email, and apps on my phone so frequently. We’ve also learned to share a phone, with separate settings, which was an adjustment but is just how it is now. It’s also different, coming off of years of unlimited data included in my plan, to change over to getting allotted a set amount of data each billing cycle (and being charged for each additional gigabyte over it); this has forced me to pay attention to how much I’m using and limit what I’m doing when not connected to WIFI (although I actually think this setup costs less than what I was paying per month at home on my former plan). Our plan allows for calls to the US for $0.20 per minute, so we have it if we need it, but we primarily make calls via Google Voice or Facebook video chat when we’re connected to WIFI. We also get unlimited texting included, regardless of where we physically are abroad in the countries we’ve visited and plan to go to on this trip. We’ve been scammed and stolen from (i.e. bras, phone, decadent chocolate torte from the communal fridge at a hostel, massages, taxi drivers) but have encountered the kindness of strangers unexpectedly time and time again (i.e. from instructors and peers in classes at gyms with welcoming smiles, complimentary feedback, local recommendations, and offered rides; from police, firefighters, and random locals on the street when stranded in a town with a flooded road into/out of it in Honduras; from people on the street in Mexico, Guatemala, Greece, and the UK directing me when I approach them asking where or which way something is — I’ve felt thankful for my ability to speak and comprehend enough Spanish and Greek to get me back on the right track from getting myself turned around or lost on multiple occasions). We’ve never actually had our safety threatened (although I’ve perceived it to be so on multiple occasions and have taken precautions, such as not going out solo in certain areas and/or after a certain hour). 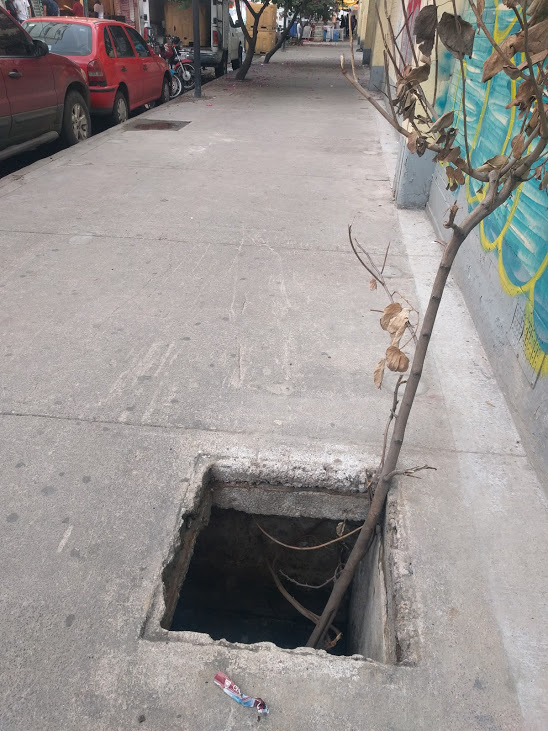 The closest, blatant situation was being cat-called multiple times when walking down the street during the day while running an errand and again en route to a Zumba® class at a local gym in Granada, Nicaragua, but I had expected it based on what I’d read and been told and found humor in it (no one touched me). 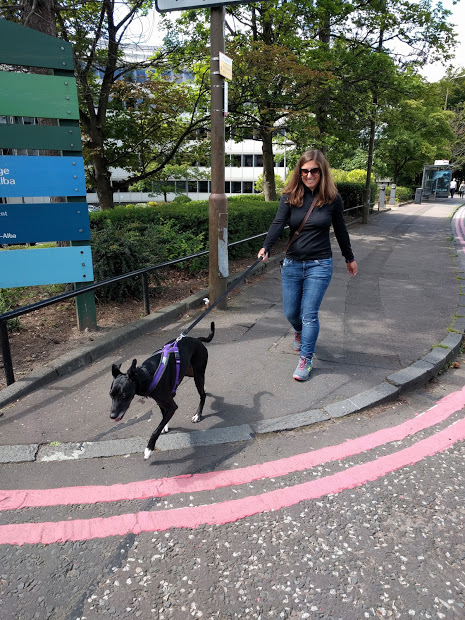 Generally, I felt much more comfortable walking around on my own, as a female, in Thailand, Greece, and the UK than in Mexico and Central America. And generally, we aren’t out and about together at night too often anyway, as after being out during the day, we like to settle in where we’re staying and enjoy how good it feels to be relaxing at our place for the rest of the evening. Aaron and I have shared more time together this past year than most couples do in many years combined. On one hand, it’s nice, on the other, it can be challenging. We’ve become frustrated, angry, irritated, upset, and more blunt with each other, but our connection and bond has strengthened as we’ve developed a deeper understanding, appreciation, and love for one another through our shared experiences. It’s also so cool to be able to reminisce about these memories we’ve made together that no one else can quite understand in the same way having not also been there to experience them first-hand, side-by-side. I’ve stripped away the vanities of appearance for the practicality in living a basic lifestyle on the move. No makeup, hair air-dried (what I also call my “cavewoman hair”) and unstyled (except for the occasional braid — I seldom have access to blowdryers and never flat irons), and basic clothing; it’s been so long now that this is just normal. 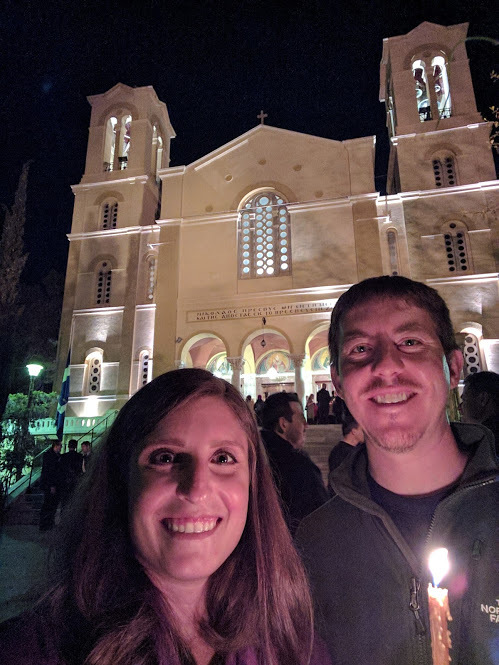 I have one outfit I procured while we were living in Athens, the first of several places where we’d live for an extended period of time, out of desire to blend in a bit more and feel more comfortable in something I might normally wear at home (i.e. fitted jeans, a light hoodie, street shoes); I feel a bit more put together every time I put it on. My facial cleansing routine is, at the very least, Dove soap, and at best, some scrubby face wash, remnants of Step 2 of my Clinique care from home poured on and soaked into a cotton ball, and some face lotion with a light SPF. I’ve washed my hair with a Lush shampoo bar to save on space and used small packets of conditioner when I could find them (when moving more frequently and in less-developed areas). We mostly use travel-sized items, except when we’re going to be in a place for awhile; we then buy regular sizes of toiletries because we’ll likely make our way through them in, say, a month’s time. Aaron already has a pretty basic personal hygiene routine back at home, but while on the road, he’s grown out his facial hair (letting it run wild for awhile, but he eventually started grooming his mustache and beard), seldom puts gel in his hair, and has one nice collared shirt we call “old collared” that he brings out from time-to-time when the occasion calls him to. I’ve become more interested and engaged in what’s happening around the globe and have started to form and express my viewpoints instead of choosing to live under a rock and leave it up to others to figure out. It was interesting watching the remainder of the campaign, leading up to the surprisingly shocking election of Donald Trump as President of the United States, and now keeping up with the aftermath, from the perspective of living outside of the country while all of this was and is happening. Also it’s notable, but unsurprising, to hear the comments from locals and other travelers about it (few understanding why him or expressing support of him). A nation’s leader acting with seeming impunity and disregard for precedent is the norm in so many places around the world, but we wouldn’t have expected it from the leader of our country; however, seeing it happen elsewhere and how it plays out gives us hope that life will go on, provides ideas on what to do to resist what we don’t agree with, and that a change in leadership will happen in the future. We’ve lived without the comfort of our own home to retreat to, without the freedom of having our own vehicle (a vast majority of the time) to get us directly where we want/need to go. We’ve lived in countries without emissions, food safety, or sanitation standards, without drinkable tap water, without consistently developed roads. We’ve soaked our produce in a solution to kill bacteria and we’ve also eaten fruit straight from their sources. We’ve wiped ourselves with toilet paper that couldn’t be flushed down the toilet (it went in a small trash bin next to the toilet), we’ve used Asian toilets and bidets, and we’ve relieved ourselves in the great outdoors (including off the dock into the ocean in the middle of the night when we were staying in a cabin above the ocean water — thank you to my mother-in-law, Joyce, for these handy instruments, which are practical for random situations like this or when camping). We’ve had our share of encounters where we just had to figure things out, go with the flow, endure whatever situation arose. In the moment I may not enjoy it, but looking back, I feel personal pride for overcoming whatever occurred! Upon arriving at a bus station in Querétaro, Mexico, after our first intra-city ride, we waited our turn to collect our backpacks from the attendant unloading them from underneath our bus. We had been given tickets in exchange for them prior to boarding in Mexico City. When it was time for me to show my ticket, I couldn’t find it. The guy refused to give me my backpack until I could show him my ticket. It was obvious it was mine, as Aaron and I were the only two left of the passengers and our backpacks were the only two left. He still persisted. I made a show of opening up and emptying contents of my purse and my pockets. Once I had dumped out almost everything, he finally just let me have my backpack. I felt embarrassed that I had to do this in the middle of the bus station and felt like all eyes were on me. Actually, I felt humiliated. Making it worse, Aaron was laughing at me. (I believe I had placed my ticket in a plastic bag with the beverage and snacks we were presented in before getting on the bus, which Aaron later used for trash disposal and likely left it on the bus, because neither of us had it when we got off the bus. So I was also partially upset with Aaron for doing that, because in my mind, he was partly responsible for contributing to the cause of my embarrassment, although he obviously didn’t know my ticket was likely in there). I could not stop the sniffles or tears from pouring out of me. I insisted on waiting until the redness from my face dissipated a bit, so it didn’t look like I had just been crying my eyes out, because we were about to be picked up by Aaron’s friend and her husband, whom I was about to meet for the first time. Needless to say, Aaron thought this situation was funny long before I did. In hindsight, I was adjusting to the newness of everything (e.g. my first bus ride in a country outside of the US, coping with traveler’s diarrhea for the first time, still feeling on alert from Mexico City being my first abroad destination of this trip and immersing myself in the distinctly different language in culture, being a long-term independent travel novice, feeling self-conscious and hyper-aware of being different and standing out from the norm already). After struggling through living in our volunteer accommodation for a week in Trat (no air conditioning, mosquitos getting into our room and biting me, insufferable humid heat, an uncomfortable twin-sized box spring-like mattress with what felt like coils pressing into my skin, with only a sheet to cover the mattress and a flat pillow), I was looking forward to moving into a cabin room on Ko Mak island. Well, it wasn’t exactly what I had in mind for the only beach experience we were going to have in Thailand (we didn’t have enough time to visit the North and the South, so we had to come to an agreement on a decision; Aaron had already been to the South, we knew there would be other beaches in our travel future, and we felt the North would offer more cultural immersion opportunities). Although it was nicer than where we had just come from, it wasn’t as nice as I had hoped for judging by the photos. 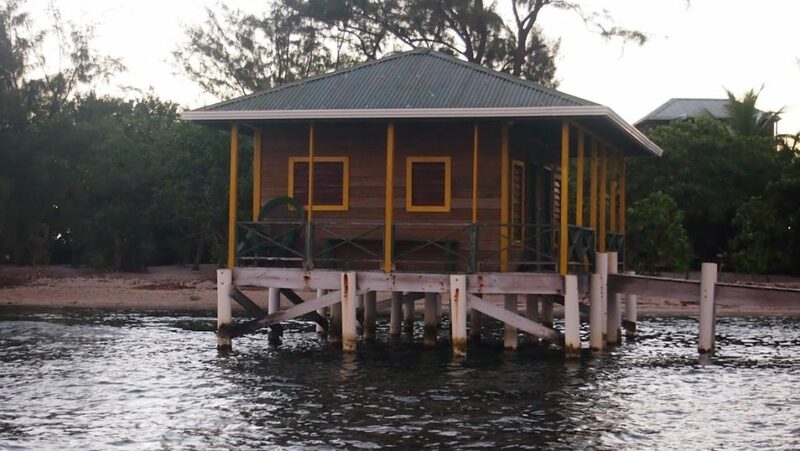 The room wasn’t completely sealed off from the outside, although it did have a wall unit air conditioner that worked quite well, and the property was quite removed from many areas of the island by foot. The beach in front of us wasn’t exactly an ideal area for swimming or wading into the water much, although the owners and their staff kept the beach itself looking maintained. On our first afternoon there, we walked around to explore and it was rough in the hot, humid heat; I tried staying hydrated as best I could, but I was a sweaty, miserable mess in that environment, with thick air to breathe, too. After breakfast the next day, another sticky, sweaty experience at one of the closer restaurants, we came back to our room. Aaron asked me what I thought, and I honestly shared as my emotions took over. I lamented being sick of lathering strong DEET repellant on, this disgusting-smelling substance that I thought was toxic to continue rubbing into my skin multiple times per day, feeling suffocated from the extreme humid heat and sweating profusely within minutes of moving around outside. I felt trapped, like I couldn’t do much because places weren’t easily accessible to us and the environment was what it was. And I was feeling a bit regretful that we didn’t build in time for more beach experiences. I felt like I wanted to be enjoying something we were paying for that was supposed to be a more enjoyable experience, rather than tolerating it and trying to see it through. 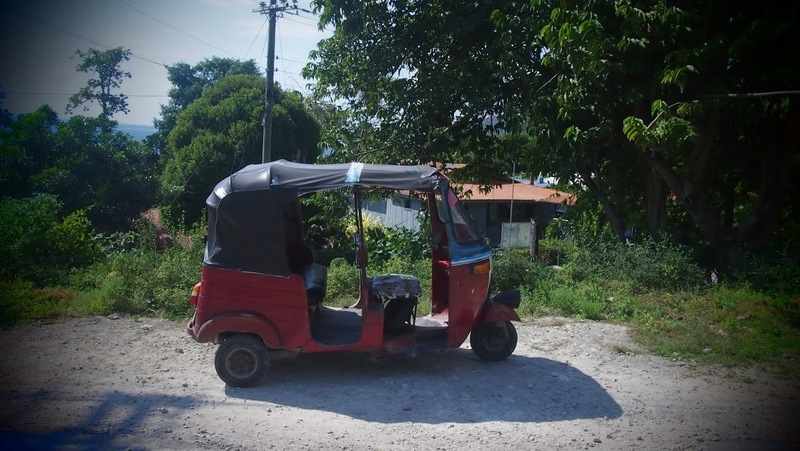 Well, after a good cry and some brainstorming about what we could do, we rented a motorbike from the owners to make exploring the island more comfortable and accessible. Coincidentally, the weather improved a bit over the next couple of days, becoming less sunny and actually a bit cooler and less humid (it even rained while we were there). 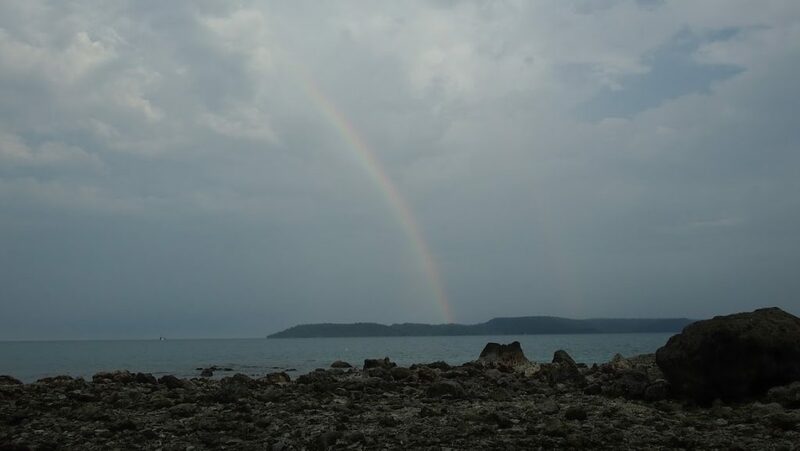 There was even a rainbow that appeared amid the gloomy afternoon as I stood in the water and looked out: Things were looking up! Beyond what I shared in the Cultural Immersion section above, which is where I described many of my travel highlights, here are several more. Driving across the US for my first time, seeing the gradually changing, diverse landscapes and noticing the local differences of what the character of places, and their people, are like within my own country, while also intermittently visiting and staying with some friends and family along the way. 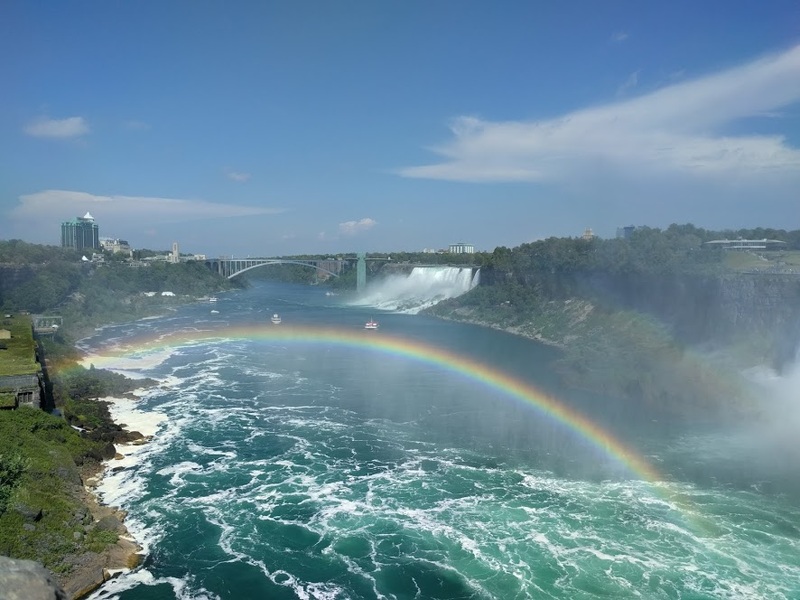 That feeling of having cool water sprayed on me while in a boat in the middle of Niagara Falls while I stood in awe of it surrounding me. Living pampered resort life while teaching Zumba® classes at Secrets Huatulco in Huatulco, Oaxaca, Mexico. Observing the seemingly unreal panorama of fireworks going off in all directions and distances at midnight on Christmas Day in Antigua, Guatemala. 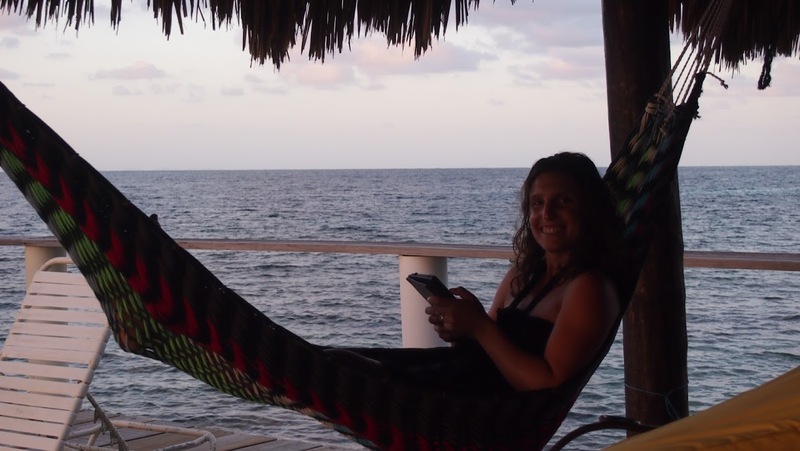 Spending a full week lounging in hammocks, reading, reviewing our Spanish notes, working out, snorkeling, and watching epic sunrises and sunsets on a semi-private island in Cayos Cochinos, Honduras. 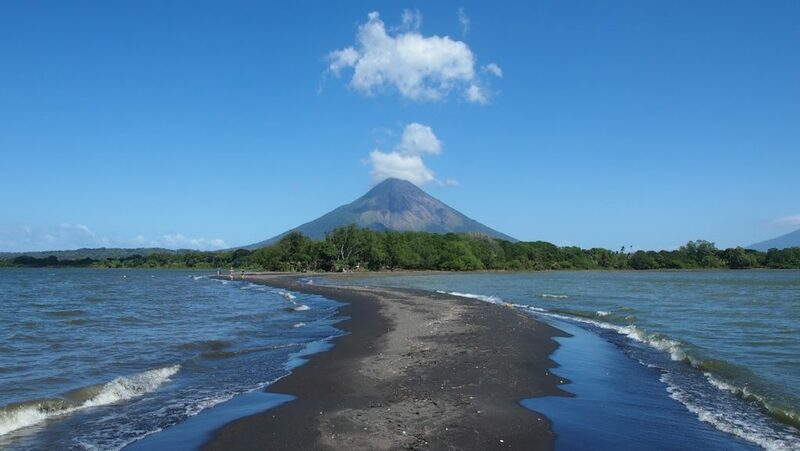 Feeling and watching moist, sparkly, black sand enveloping my feet as I walked on the beach while volcanos paint the backdrop on Isla de Ometepe, Nicaragua. Zip-lining from platform to platform in the trees while capturing glimpses below and in the distance of San Juan del Sur, Nicaragua. 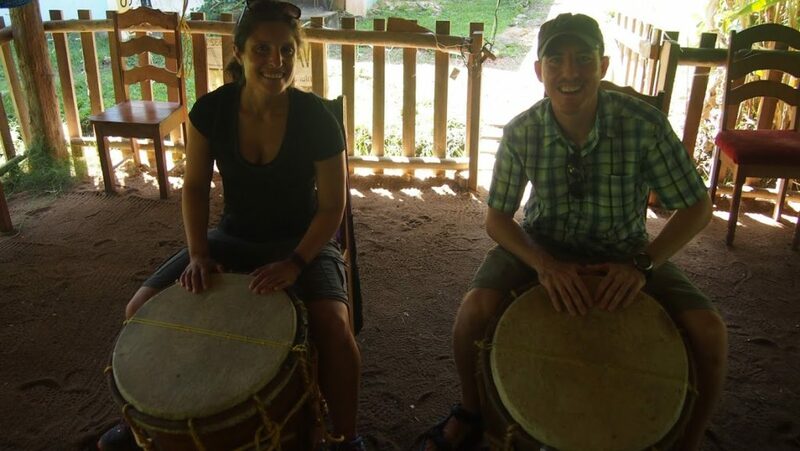 Taking Garifuna drumming lessons in Punta Gorda, Belize. 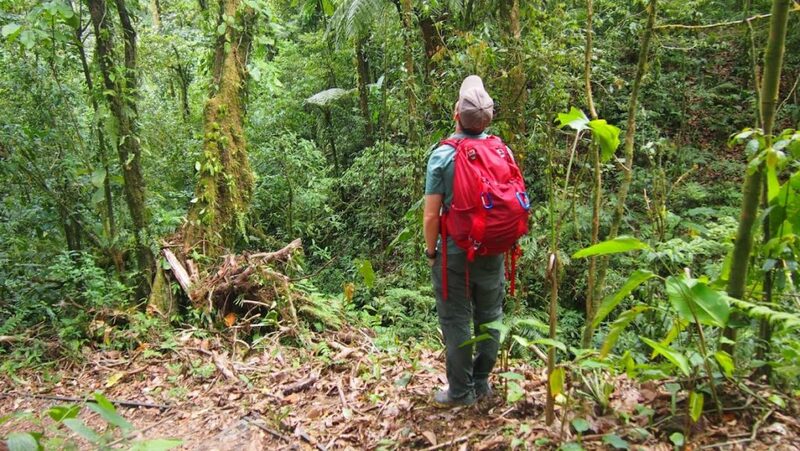 Finally seeing the rarely sighted, colorful, distinct Quetzal birds (both male and female!) with a couple (new friends of ours who have since moved to California, and more specifically, near Fresno!) we met at our hostel in Monteverde, Costa Rica. 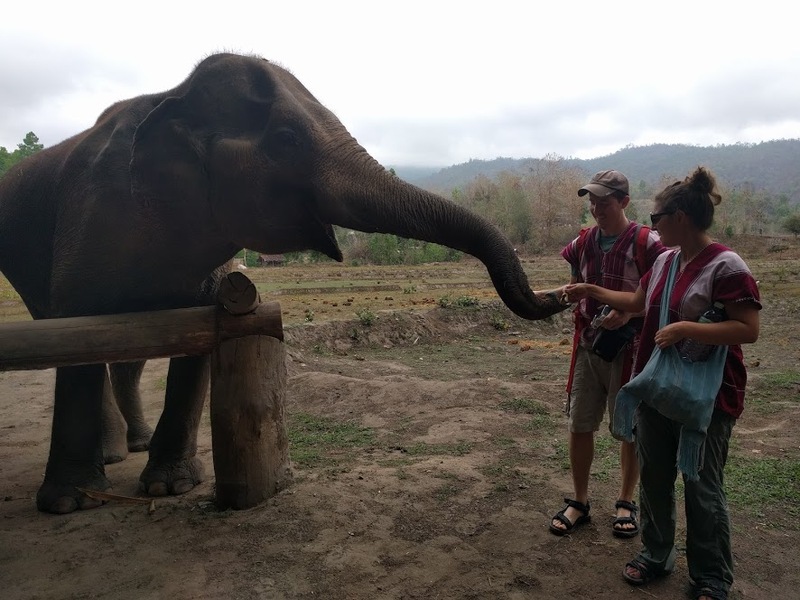 Feeding, walking side-by-side with, bathing, and hanging out with elephants in Northern Thailand. 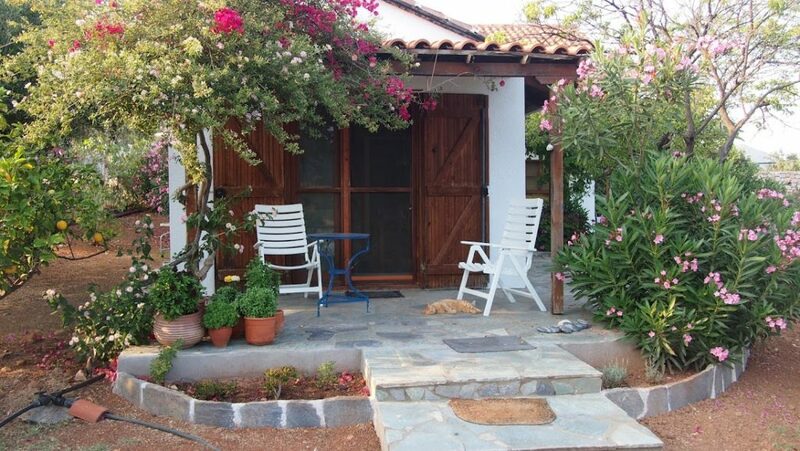 Living for an extended period of time as locals in Athens, Monemvasia, and London, while seemingly simple, has been a wonderful break from moving so often, allowing us to feel settled in and enjoy basic, lovely daily routines in our neighborhoods and surrounding areas. 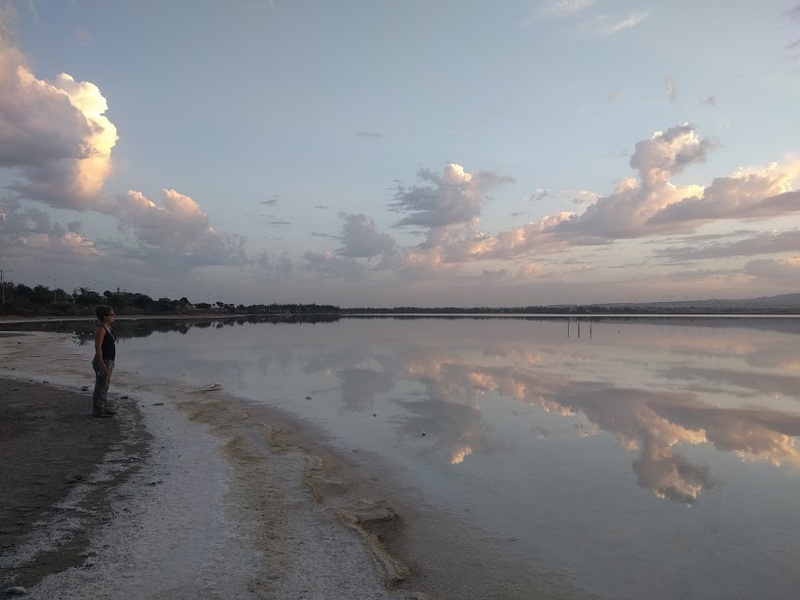 I saw my first salt lake in Larnaca, Cyprus, (it’s a bit stinky and mucky, but it’s beautiful!) and got to have the long-awaited beach time I was desiring while in Thailand there (living days with beaches within walking distance from where we were staying). I also loved our opportunity to drive through a few wine regions (of which we learned there are seven total in Cyprus!) and stop at several wineries during our road trip, tasting and being introduced to local varietals, including the Commandaria, which Cypriots claim is the world’s oldest wine and its region still produces it by the traditional method! 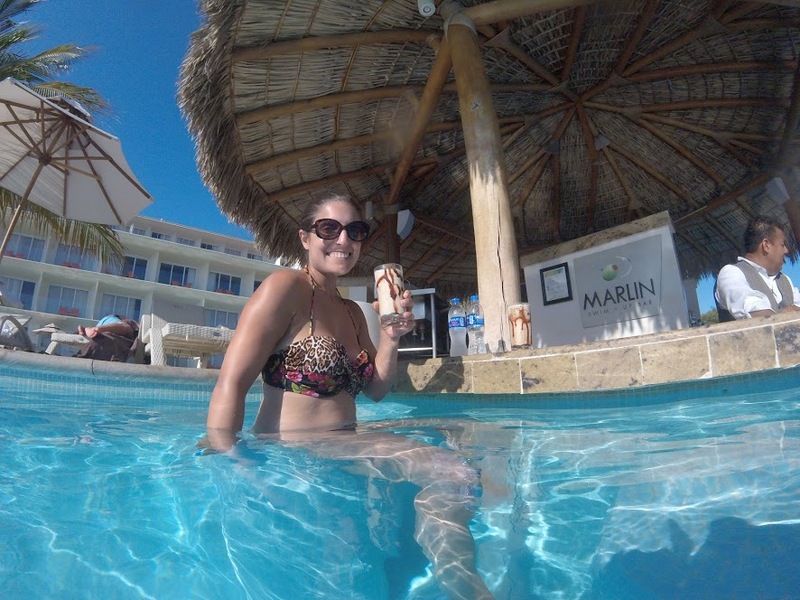 Me and my mudslide at the swim-up pool bar (after teaching two classes per day, I felt like I deserved it)! Every place is different — noticeably on the surface, language and culture — but certain things are the same everywhere. 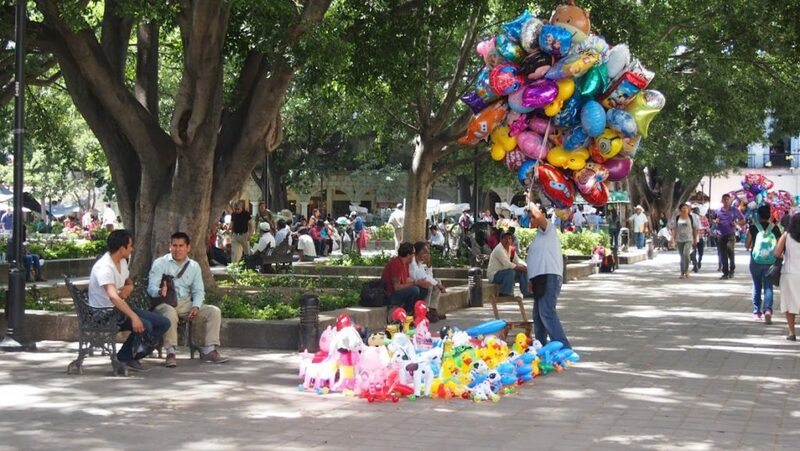 Communal, public gatherings: People in Mexico and Central America hang out in the squares of town, the main one usually having the feel of a cemented park with some green space and centered around a church, government buildings, restaurants, and shop with street vendors walking around peddling their products. In Greece and Cyprus, the popular gathering place is the kaφ∈v∈ío, or cafe. Londoners gather publicly in parks, soaking up the sun on blankets and baring skin like beachgoers but without a beach, as Munich residents do similarly on grassy areas by the river. (Nice, sunny weather is a rare gift that is not taken for granted in England and Germany)! 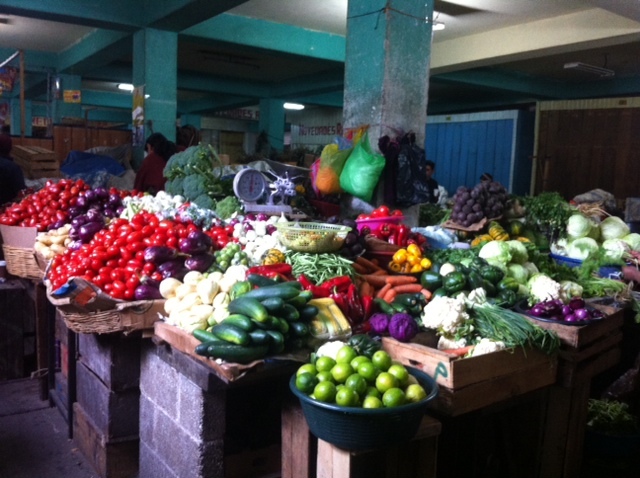 There are produce and artisan craft markets everywhere. 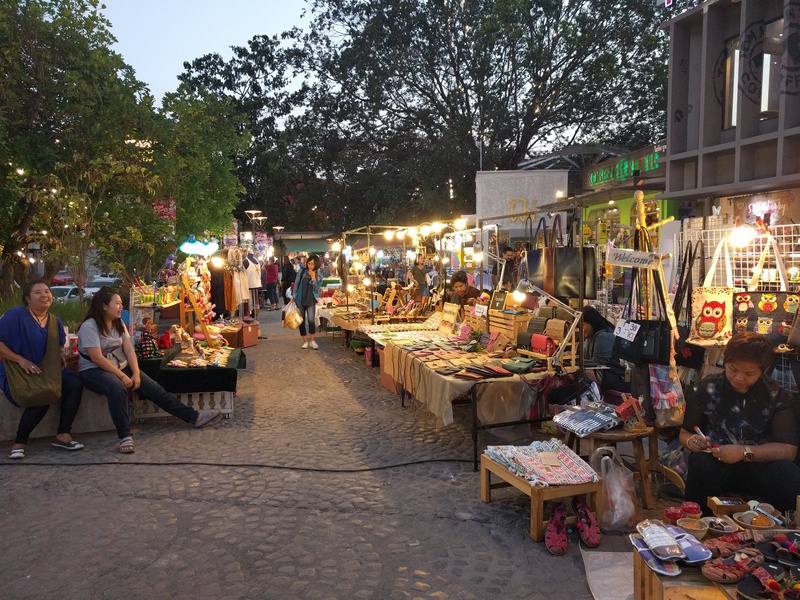 Negotiating on a price is common in Mexico, Central America, and Thailand with most street market vendors, and even at some indoor shops. We’ve noticed the produce markets in London do not feature local farmers as they do in most other places we’ve encountered them, but rather the types of produce you’d find in the produce section of a typical grocery store (although actually, not as good because they often sell produce in a pre-filled bowl for £1, and you can usually salvage a few pieces that aren’t already turning). 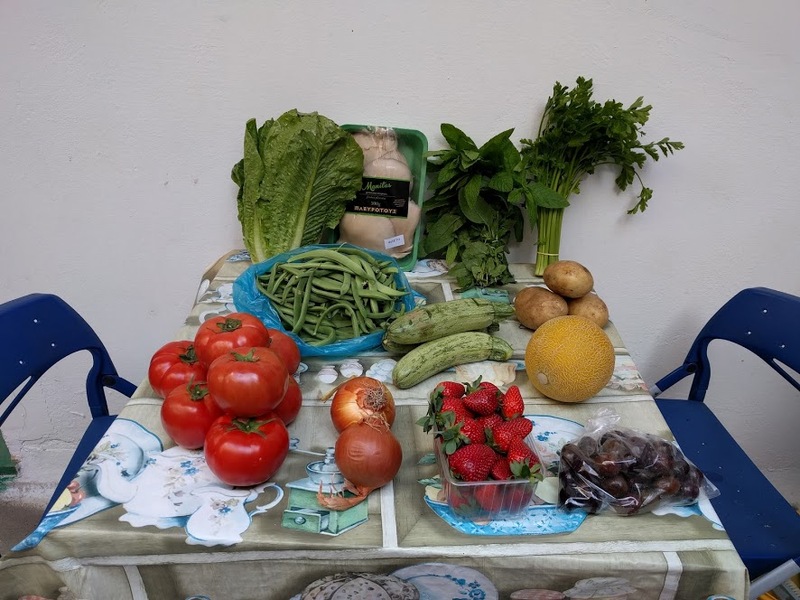 Street food is abundant in Mexico, Central America, and Thailand (and it’s wise to be selective due to food safety concerns), but not so much in Cyprus, Greece, and the UK. 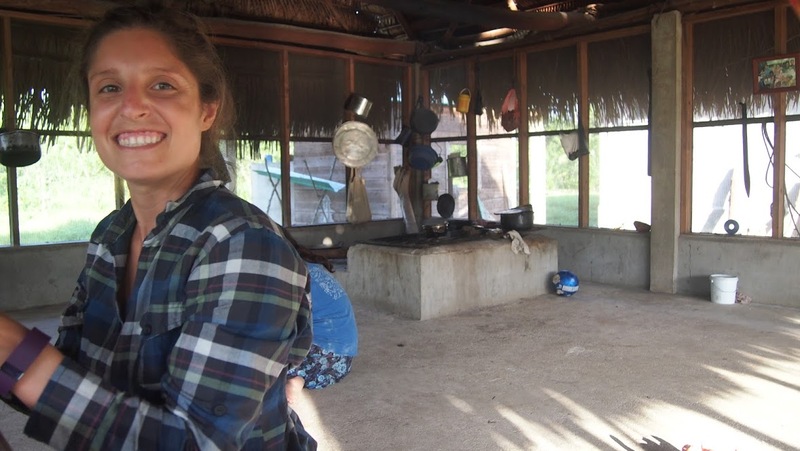 Mexicans and Greeks are generally loud and expressive, where Thai people are more reserved and polite. 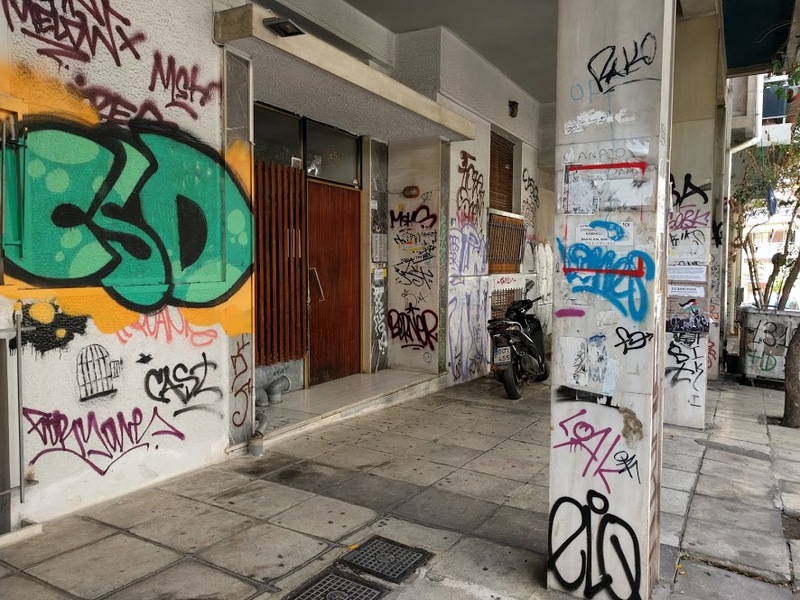 Grafitti is often used as a form of expression, particularly in Mexico, Central America, and Greece, and doesn’t necessarily (or often times) indicate that a neighborhood is dangerous or undesirable. 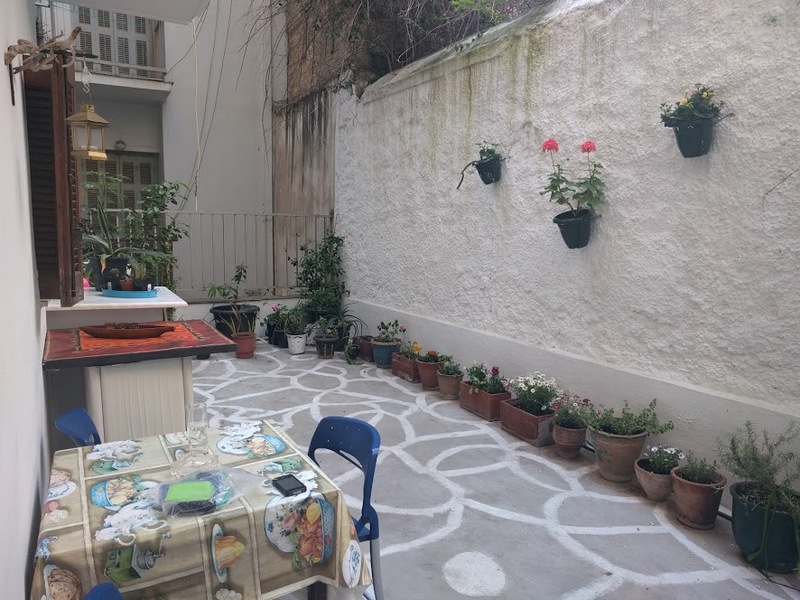 Case in point: Our studio apartment in Athens is in the midst of Exarchia, likely the most tagged neighborhood in the city, and it has a lot to offer! 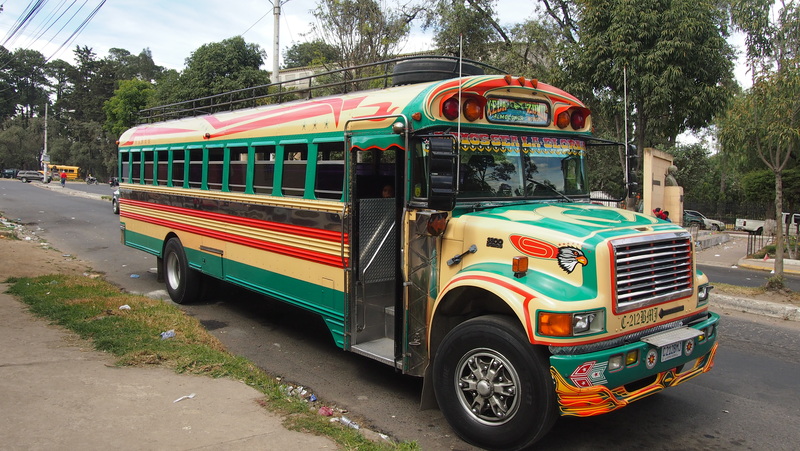 Music and dance are the richest, the most culturally represented in Mexico and Central America (I may be biased because of my love for reggaeton, but you’ve also got salsa, cumbia, bachata, and more to pick up on pretty much everywhere you go)! Regardless of where we are in the world, people are just trying to make a living for themselves and their families and enjoy life to the extent that they can. Whether hoping to make a sale presenting artisan crafts on a blanket on the street with a baby in your arms late at night in Oaxaca City to put food on the table, or driving for Uber in 12-hour shifts in Athens to make ends meet while trying to find a job to put a recently-earned university degree to use, or partnering with a tour company to invite tourists to come into your home in a small pueblo near Antigua and learn about the family business of producing all-natural peanut butter by hand, or working a typical office job for a large corporation, the reason for doing it is the same. The difference is the access to education, training, resources, and opportunities and the economy in the country and local area you live in. We’ve gotten into a typical flow of the process of setting ourselves up wherever we are, figuring out where things are to become more familiar with our new surroundings. Knowing where the nearest grocery store, public transit, coffee shop, park, and post office (although we had no access to international mail services for our entire two months in Guatemala due to the system being in transition to private) are have helped us get up to speed to acclimate quickly! 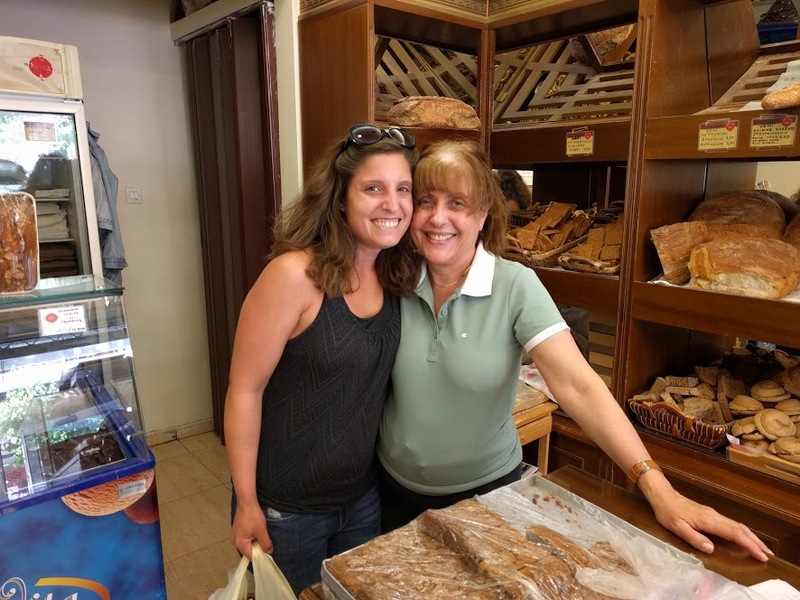 I also love to be in a place long enough to discover and frequent places with familiar faces to greet me and interact with, like our bakery around the corner from our apartment in Athens where this sweet lady got accustomed to me practicing my Greek and was patient and kind with me (we went back to pick up a couple of items on our quick overnight back in Athens between Cyprus and Monemvasia, and she was happy to see us and gave us free mini ice cream bars to go)! The architecture is drastically different from Mexico and Central America to Thailand to Greece to Germany to the UK. Rooms facing an outdoor courtyard on a family compound in Oaxaca City, surrounded by sturdy walls versus towering gothic-style buildings in Edinburgh, Scotland. Of course rural versus urban environments differ within a country as well, just like it does in the US. It’s been a great, interesting variety to see and compare and contrast with one another over time as we’ve moved around in our travels gradually! Aside from walking A LOT, we carry resistance tubing and bands with us for dedicated workouts. Although we are both active, exercising together was a new thing for us at the onset of our trip. It took some getting used to (ehem, Aaron doesn’t listen to me like my students do! ), but I’ll admit it’s been fun (even though Aaron tries to distract my concentration by making guttural noises and teeth-clenching facial expressions, or telling me things that he knows I don’t like, such as sayings meant to motivate but actually do the opposite, like “No pain, no gain”). 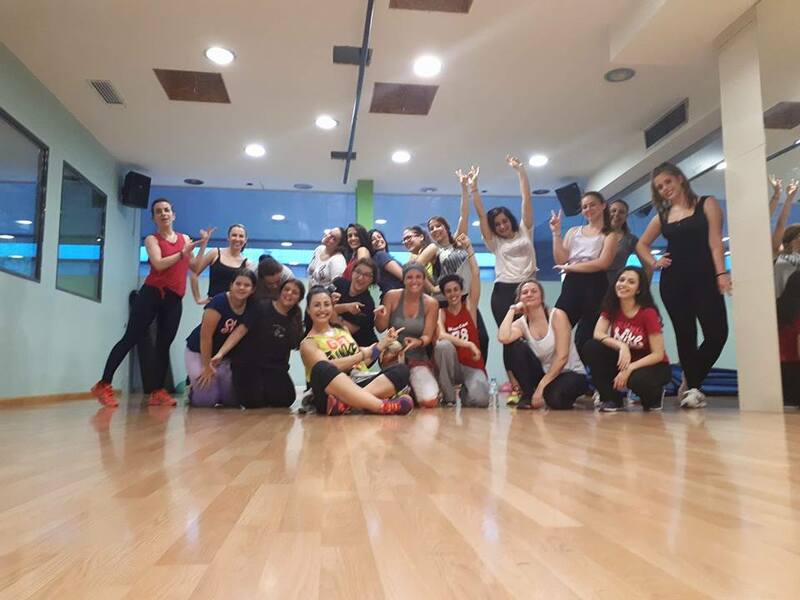 I’ve had the opportunity to take fitness classes and experience many, talented instructors from around the world, while also getting the occasional opportunity to teach and share my own Zumba® choreography, style, and music. It’s truly been a treat to be able to be a student again, learn, notice the differences and similarities in style among countries and individual instructors within them, enjoy as a group fitness enthusiast, and appreciate from the perspective of being an instructor myself! It’s just so unique and neat to be able to meet and make connections with so many nice and welcoming locals this way. It’s made me feel comfortable in places where I otherwise felt like an outsider, something visibly noticeable that I share in common with others in the room. I may not speak the language fluently everywhere I go, but I speak the seemingly universal language of dance! 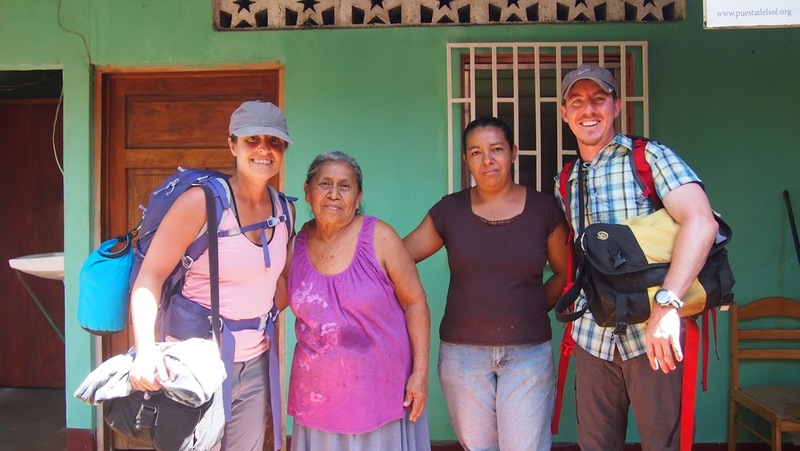 Because of these types of experiences I’ve had while traveling, I want to pay it forward! I’ve developed an understanding for why it’s important to have a collaborative attitude towards my fellow fitness instructors in my own community back home, what it feels like on the receiving end of that attitude in action, and I plan to make more of an effort to invite guest instructors to my own classes (and make time to occasionally drop into theirs) as well as participate in local events where I can share my love of dance with my fellow instructors and my students by my side! I look forward to exposing my students to choreography and music I’ve picked up from my peers throughout my travels; they can travel around the world with me through dance from the comfort of our studio! I’ve been able to try out new class formats I hadn’t before, such as Oula, Line Dancing, Kettlebells, and Insanity. I’ve also taken classes such as Les Mills (BodyCombat, BodyPump, BodyAttack), Yoga, Pilates, Barre, Bootcamp, Circuit, and Dance Fitness. I’ve gotten a better sense for what else I might, and might not, want to pursue learning how to teach when I return home. Post-Zumba class photo with the very talented Dimitra and her students at my gym in Athens! 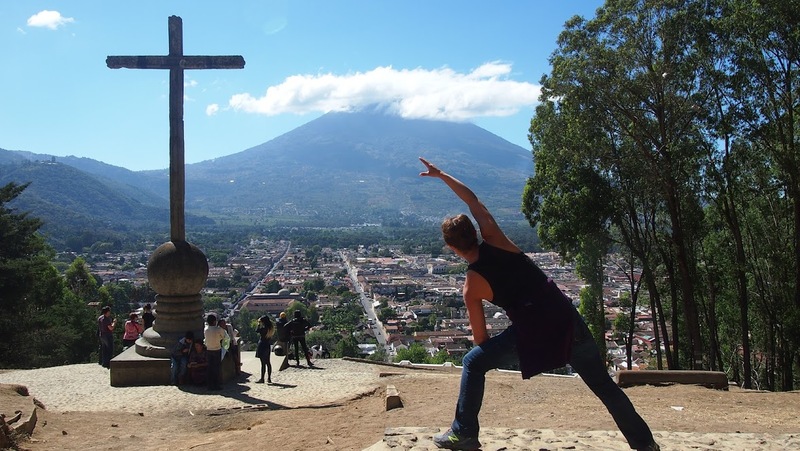 Aaron’s had the opportunity to hike a variety of terrain, most uniquely, volcanos in Guatemala! 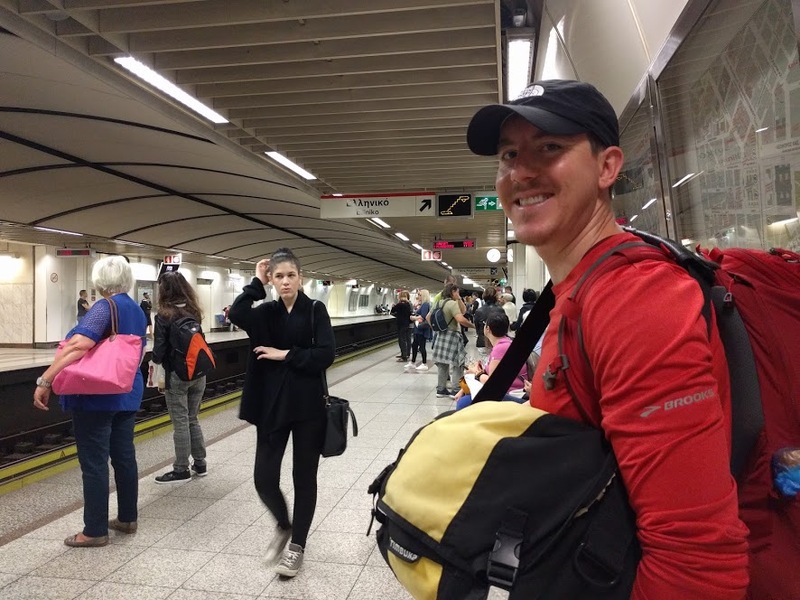 He’s gone on plenty of solo hikes, as well as organized group treks, in Guatemala, Cyprus, Thailand, Greece, and the UK! 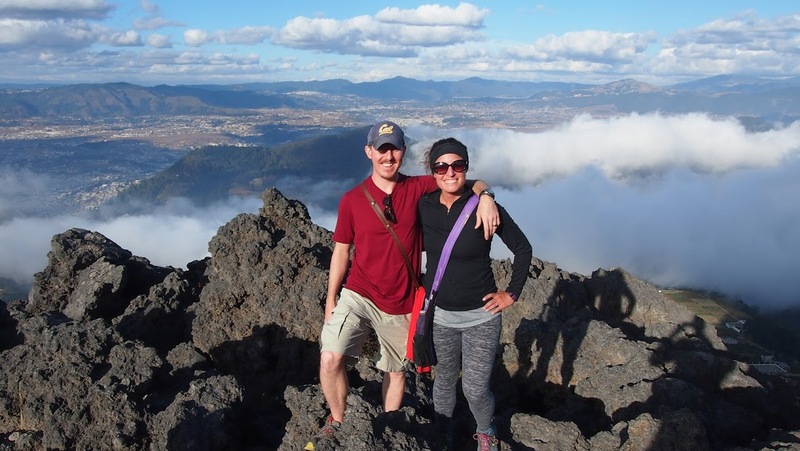 (I don’t love hiking and I am not at his level as far as pace and enjoyment of the exertion itself, so beyond what we hike together, Aaron needs to seek out more to get his fix since he is an avid hiker)! You can read more about his accounts here! Our frequency of completing set exercise routines varies based on where we are and what we have going on, but overall, I’m pleased with our dedication to not let it go to the wayside completely. We’ve learned to be okay with not having dedicated workouts as often as we normally do back home based on what our travel plans are, and being okay with not knowing what ingredients are going into our food or where it comes from (because it’s near impossible to know sometimes). 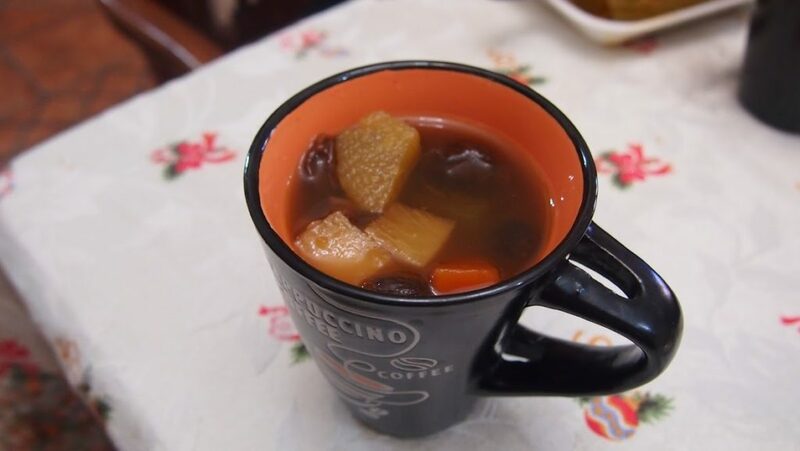 Besides, we would be missing out on unique cultural cuisine if we were to avoid it all together and insist on eating like we do at home all the time. 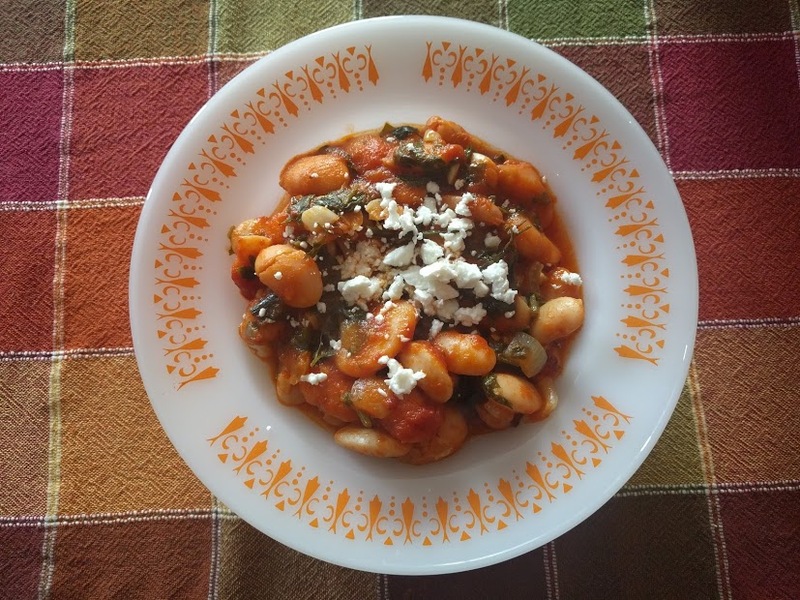 On the road, we typically eat three meals per day (usually larger portions than at home, as we don’t always know when or what our next meal will be) versus grazing throughout the day on healthy snacks and eating smaller-portioned mains. We’ve certainly fluctuated in weight and body composition throughout our travels, due to changing exercise and eating habits, although we seldom have access to tools to measure and monitor these metrics, so we go by what our clothing fits like, what we notice visually in our bodies, and how we feel. Regardless of where we are, we always have movement in mind and pay attention to our bodies’ signals for being full, which is especially important when we have little control over what it is we’re eating. Right now we’re in a place where we’ve been able to dedicate a similar amount of time to exercise to what we do back at home. 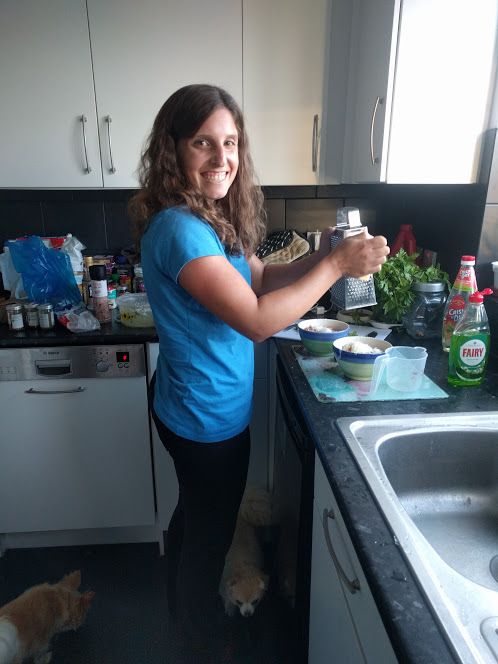 Food is the tougher part, and unsurprisingly, we find we fare much better when we’re in a situation where we can prepare and control our food intake, when we have access to a well-equipped and functional kitchen. I’ve enjoyed performing a fitness movement or striking a pose with a scenic travel backdrop to share through photos and videos, or capturing outdoor fitness equipment I come across (and sometimes, test out myself) while exploring. 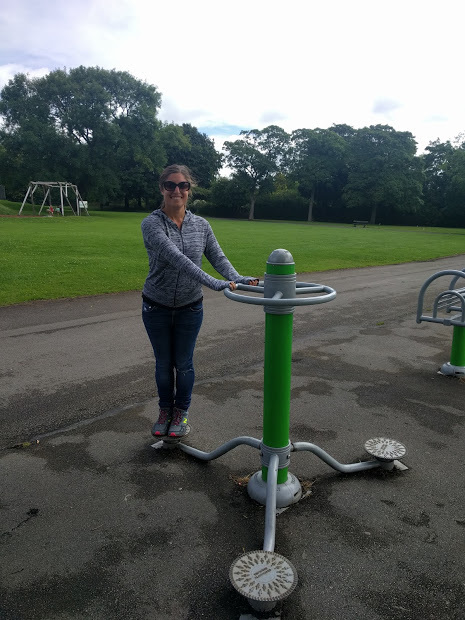 I love spreading the message that opportunities for movement and exercise are available anywhere and everywhere in the world, sometimes you just have to keep your eyes open and be a bit creative to find them! A year ago, I had only left the U.S. three times previously (Mexico for a week-long, quintessential Spring Break party in college; Greece for two weeks for my first abroad trip with Aaron in 2012; and Croatia, Slovenia, Italy, and Bosnia-Herzegovena, for our three-week honeymoon in 2014). 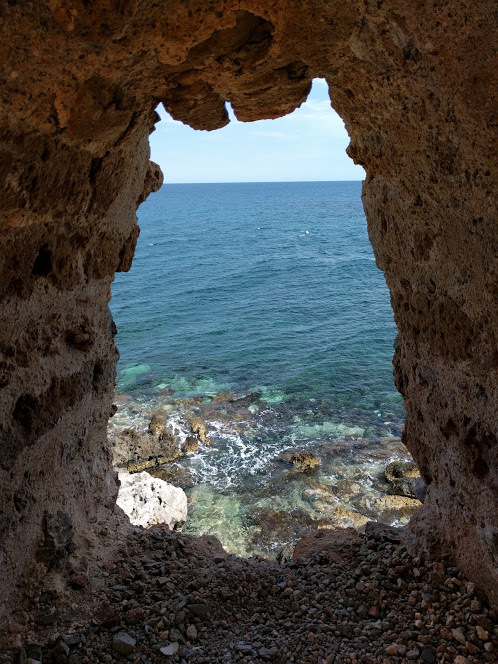 I set out on this journey wanting to emerge from my cocoon as a travel novice and intending to open myself up to the unknown path ahead of me, full of possibility, excitement, and fear, too. While I feel like a more experienced traveler as I reflect these days, I’ve realized through this process how we’ve only just scratched the surface of experiencing all the different countries, with their distinct cultures and languages, that exist in this world we live in. However, I feel so fulfilled by and fortunate for what we’ve found along the way, and I realize that what we’ve had the opportunity to see and learn about first-hand is more than most people do in a lifetime. 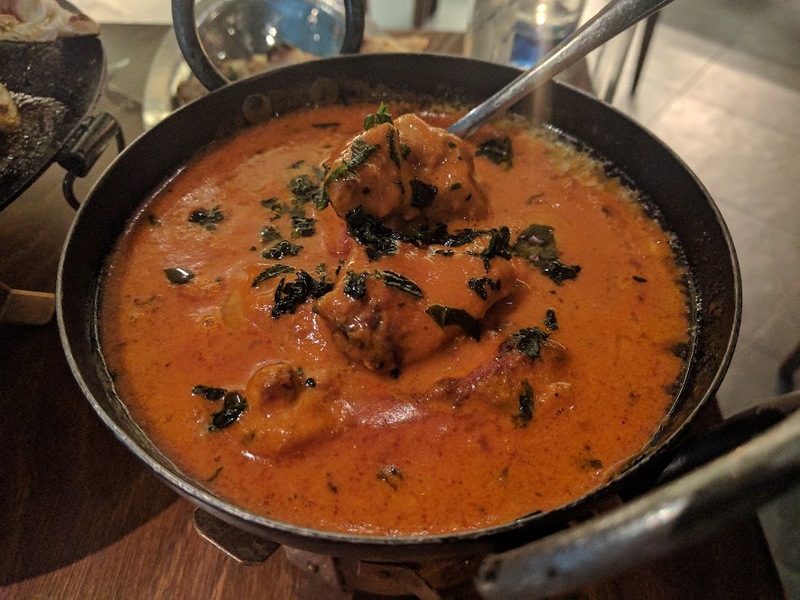 I’ve also experienced so many firsts, large and small, on this trip, not only being in certain US states or countries abroad (and admittedly, finding out where exactly they are on a map in some cases when it comes to countries outside of the US) but in activities, cuisine, and encounters. This has provided a fulfilling sense of adventure for me! 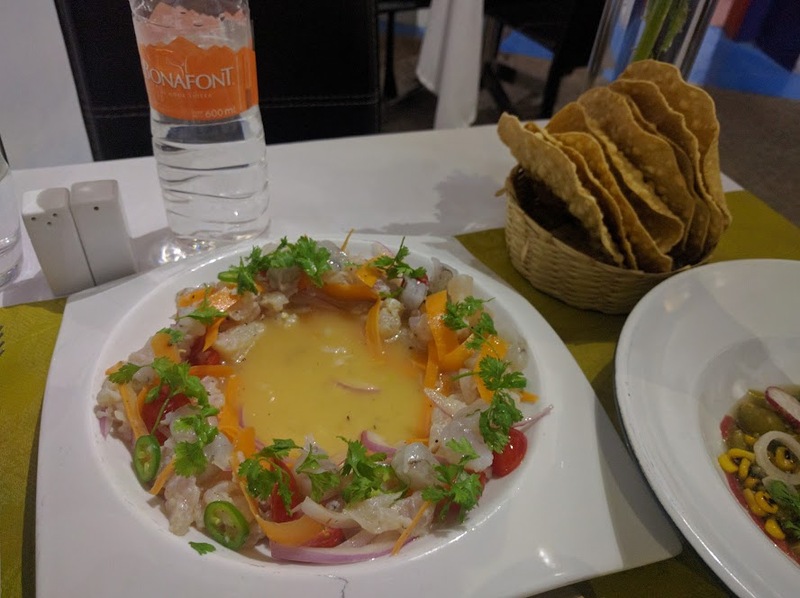 For example, before this trip, I’d never tried Bangladeshi or Taiwanese food, nor the freshly-made tortillas of varying thickness and consistencies in Mexico and Central America. I’d never walked through a coffee plantation (which we did in Guatemala in the highlands at a cooperative), a banana and avocado farmland (our Nicaraguan host family readily took us on a tour of their private property on Isla de Ometepe) nor Mescal production facility and tasting room (this happened in Mexico on a group tour we went on from Oaxaca City) and learned about how their final products are made. 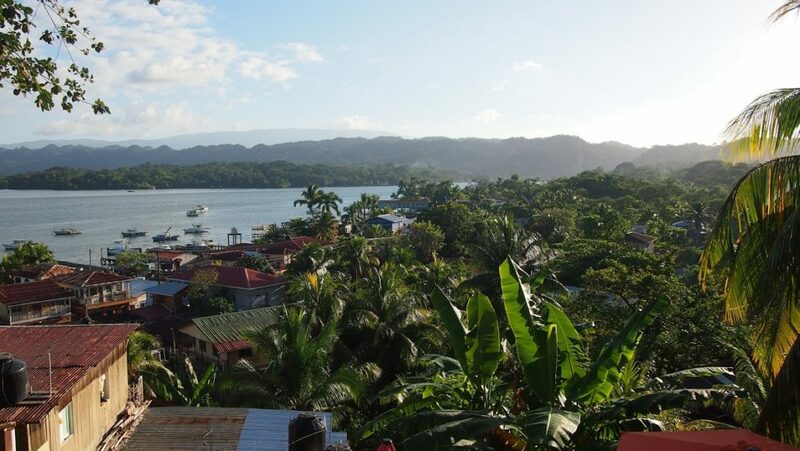 I hadn’t ever snorkeled, gotten a Henna tattoo, been responsible for caring for dogs, learned what cacao plants look like and how to make chocolate from them, stayed in a hostel, or heard of Garifuna dancing (or culture, for that matter). I’d never known what it felt like to be away from home for more than a few weeks at a time (and that was extremely rare), what it would be like to spend such a lengthy period of time away from the responsibilities of a typical, full-time office job (as an adult), our families and friends, the life we had built for ourselves and were living in our community of Midtown Sacramento. Some of my most challenging times, I actually look back on with a twisted sort of fondness and nostalgia for. Why? Because I personally pushed through and overcame them. I’m proud of myself for working through the rougher encounters we were faced with. And often there were awesome trade-offs in exchange for enduring the more difficult times. For example, I cranked up my music on my iPod and jammed out to my latest favorite discoveries in popular Latin chart-toppers to get me through hours of uncomfortable overland travel in an overcrowded, stuffy van, bumping along, surging forward, stopping abruptly, and swerving often around potholes as my cramped and sore body felt thrashed around and stiff and my stomach felt uneasy. 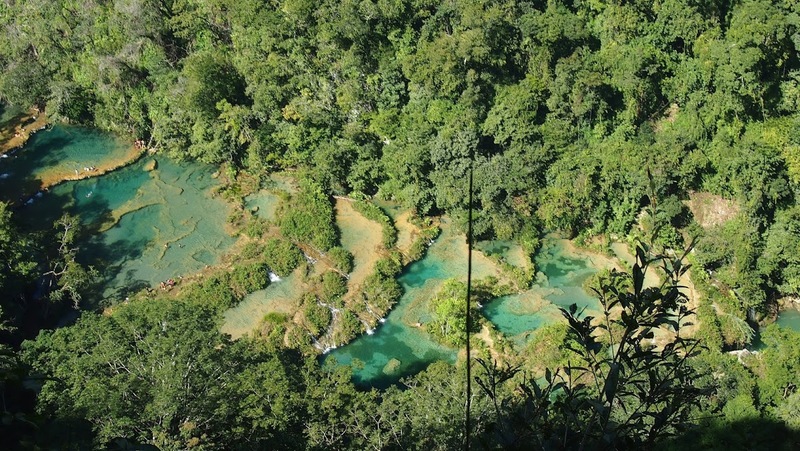 During my toughest overland transit journey from Semuc Champey to Flores, symptoms of my second intestinal infection surfaced and intensified. 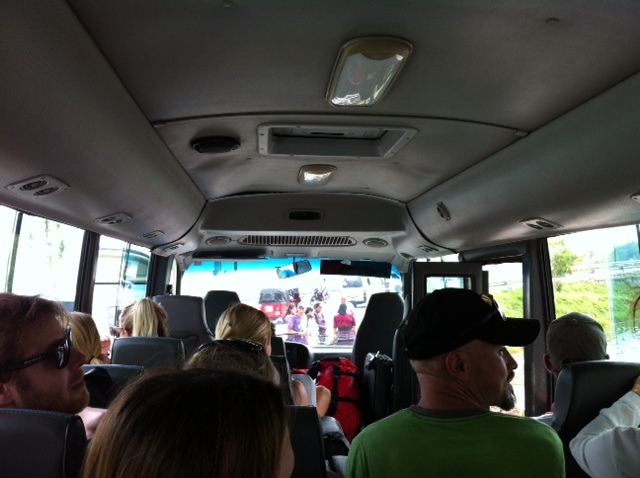 As grueling as some of them were, these rides allowed me to experience Guatemala, Honduras, Nicaragua, and Costa Rica. I could have easily just said, “That’s it, I’m not doing this anymore, I’m done“, but I didn’t, and I have such unique, first-hand memories of what those places are like as a result. 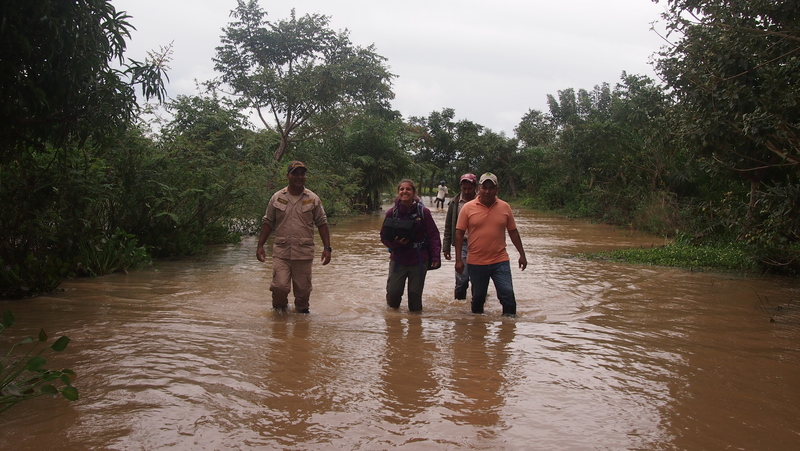 I endured one of the most nerve-racking and actually, painful, rides of my life, as our small boat from La Ceiba, Honduras, out to the remote Cayos Cochinos islands, pounded hard as it rocked and crashed onto strong waves intermittently, but regularly, for about forty-five minutes. Some of those landings literally hurt my body as I, in my seated position, was forced from my bench and thudded back onto my seat. I closed my eyes tight and squeezed Aaron’s hand for awhile until I finally felt confident I wasn’t going to be forcefully tossed overboard by the sea. We had to pre-plan all of our meals for that week and carry many heavy bags of groceries with us (yes, from the store to our hostel to our driver’s car to the boat to the kitchen on the island property), as there are no stores on the island, just our accommodations (and we nearly ran out of food at the end). 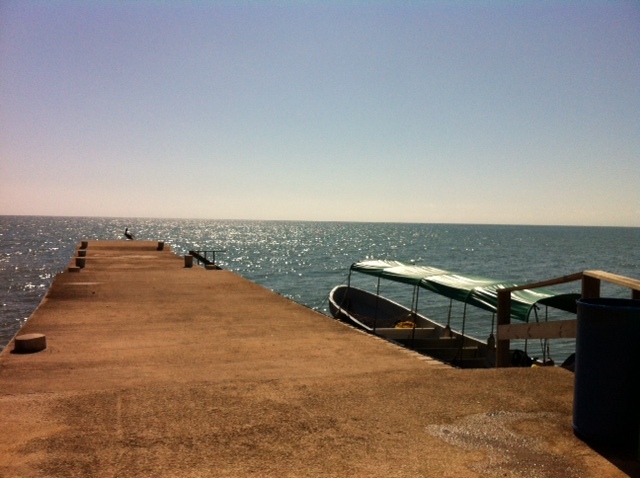 Our journey back to La Ceiba was, well, you can read about it here. 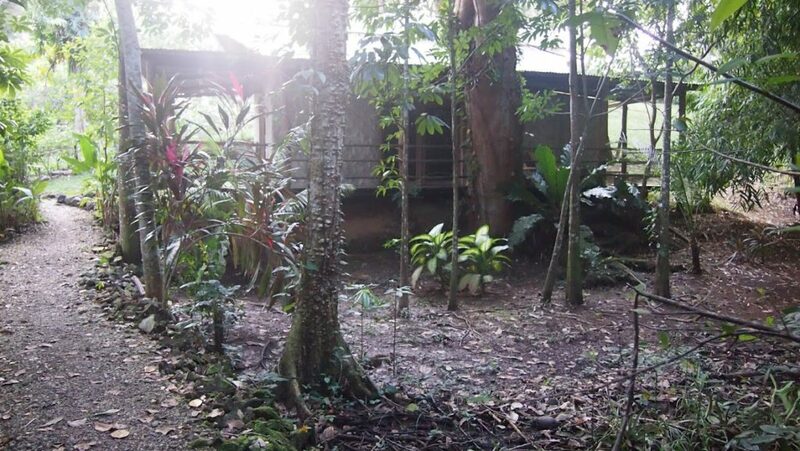 The tradeoff was we got to spend a full week in a secluded, relaxing, quiet, picturesque environment; we had so much beauty to enjoy all to ourselves (aside from the caretakers of the property, a Honduran couple, and their dogs). As someone who likes stability and knowing and controlling what I’m getting myself into in my regular life back at home, I have embraced the novelty of unpredictability that living life on the road long-term brings. I’ve actually found that it’s been fun to just let go of expectations. Being okay with changes that come about that are different from the plan and just going with them. As a result, I’ve been better able to get through situations I don’t like as well as experience cool stuff I didn’t expect to and couldn’t have predicted in advance. I am more confident in my ability to figure things out, sometimes because I just have to (for example, use the Spanish I know to communicate with those around me and figure out how to get out of the town we’re stranded in because the bus isn’t running and taxi’s aren’t coming through due to the solo road into town being flooded, or searching for where a bus stop is for the bus number I need to get back to our place in the boroughs of London without a WIFI connection). Now knowing what it’s like, what I’ve experienced before and after more trying times, I can see the bigger picture of the “why” and push my way through what I need to in order to get there, rather than forego something potentially awesome. I’ve realized I’m more adaptable when approaching change or uncertainty, even if I don’t like it. Also, if I could get through what I have, I’m confident I can handle what life will throw at me when we return to living at home in the US dealing with “first world problems”. I feel more connected to the parts of the world that we’ve gotten to know in the time we visited, or for longer stays, actually lived there. 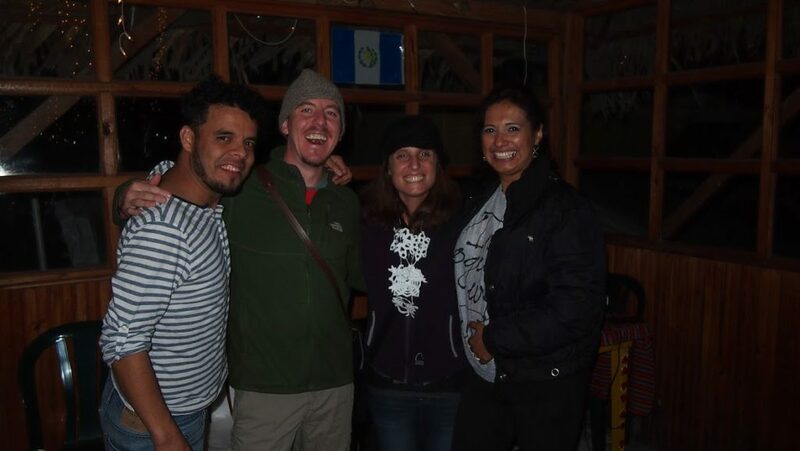 Especially when meeting and interacting with locals and truly immersing ourselves to the extent that we could. Trying to understand what real life is like in those places that were previously far away locations we may not have known even existed, or knew very little, on-the-surface information about, or even had developed misconceptions based on what we’d read or heard. For example, we had been cautioned about how dangerous Mexico is prior to going (from people who had never gone themselves, or hadn’t ventured off of resort properties). Sure, there are dangerous parts of Mexico that should be avoided (as is the case pretty much anywhere in the world), but there are also many places (such as Mexico City, Querétaro, Oaxaca, and Chiapas) where tourism is alive and people from all over the world travel to (based on our experiences there, we think Americans, as a whole, are really missing out on these places based on fears that are ingrained, but are mostly unfounded)! It’s also been interesting to learn about local history and why things are the way they are where we are. For example, we became aware of the conflicts in Cyprus that led to the Turkish invasion of Northern Cyprus in 1974 that explain why the country is still divided today between the Greeks and the Turks (people from each of these countries and native Cypriot Greeks and Turks); we visited Nicosia, also known as Lefkosia, which is the capital city and a place where the border lies. We also became familiar with how the indigenous Mayan people in Guatemala have struggled a long and dark history of being massacred, forced to defend their land and preserve their customs and way of life; although they make up about 40% of the population in Guatemala, they are among the poorest economically and still face political oppression today, fighting for basic human rights. (The majority of Guatemalans are Ladino, or those of Spanish descent, and Mestizo, or indigenous mixed with those of Spanish descent). Stepping away from life as I knew it at home, at the point and time around when we left, free of the commitments and obligations of everyday life, instead taking on the transient lifestyle with an open slate in which to fill our time, I have a much clearer picture of what I love, what I’m passionate about, and what I want to do with my life when we return. I’m learning new skills, coming across new ideas, and that list is expanding as I figure out how to make it work. It’s also even more evident what I don’t want. But that journey is a whole different, new, exciting chapter that awaits us. I’ve definitely gone through a couple of periods of time in the past few months where I’ve wanted to work. Literally minutes walking distance from the beach with an endless amount of free time in rural Greece, and I’m looking for ways to land a recruiting project (Aaron finds this especially comical because I’d expressed to him throughout our entire trip to this point that all I wanted to do is finally get to a place again where all I have to do is have some beach time — which by the way, I’ve learned I like in small chunks and not lounging out all day exposed to the sun, and also on a beach chair). I’m so excited and anxious to get started on pursuing my plans for growing my fitness, health, and wellness career that when I see rare opportunities pop up that are exactly what I’m looking for ideally, I want to go for it! I’ve come across freelance recruiter work as well that I think would fit into a schedule I make for myself with a significant increase in my time dedicated to my fitness industry work. I came across some words I needed to see recently, something along the lines of, “The opportunity meant for you will not pass you by.” What I see that is available now may seem like a perfect fit, but it’s still not the right time (which is a pill I’m all too used to swallowing, awaiting the right time to finally make the transition I’ve researched, contemplated, and dreamed about for years). I think I’m better able to put into perspective what really matters in life. Actively maintaining relationships with the family members and friends who are most important to me. Pursuing my career path and life back home like we did our travels, with the mantra that we work to live and not the other way around (sadly, the opposite of what is all too common in our country). Appreciating what we have with fresh eyes, knowing what it’s like to not have them for prolonged periods of time. Treating others with kindness and understanding. Continuing to learn about cultures different from our own. We’re becoming more aware of how close we are to the end of our travel journey. Although we still have several months left, which is by no means a short amount of time, we are gradually nearing closer and closer to the end. And when we think about actual places we’re headed, the list is pretty short from this point on (which we surmise makes it seem, to us, like it’s going to happen so soon). Part of us is sad, another part of us is ready. But yet another part of us is aware that we might not be ready. Thankfully, because of our diligence in keeping our travel costs down, and as a result staying under budget, we will have the option to potentially extend our travels a bit further after our return home in December. At this point, it’s unlikely and feels more like a pie in the sky, but we’re both open to the possibility. We’re tabling the serious conversations and decision-making process to a later date when it’s more eminent. For now, we’re fully embracing the time we have left where we are and are aware on a daily basis of how important it is for us to soak up everything we can, what we want to do with our time, what this lifestyle is granting us. If I can get into a routine, I feel more comfortable wherever I am. 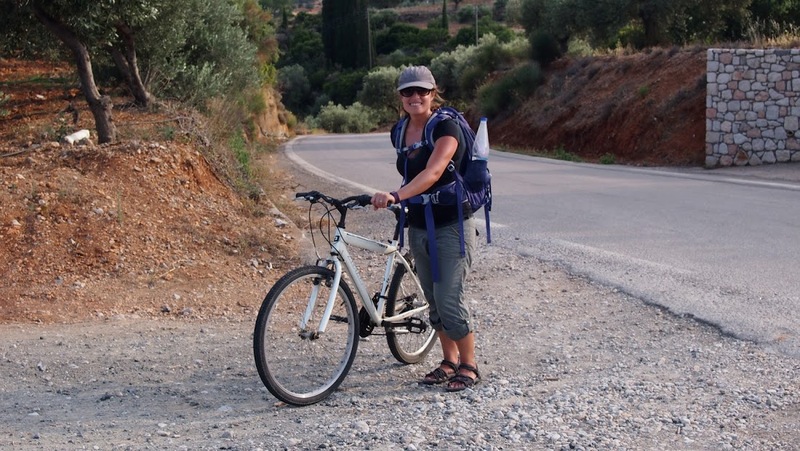 Being able to slow travel in Athens, Monemvasia, and within the UK has afforded me this and I’ve completely indulged in it. Right now I’m loving my life with a pretty similar comfort-level as I have in, and familiarity to, the U.S. (besides, of course, the differences in speech; the side of the road people drive on; the ethnic group differences in diversity, which surprised us — for example, loads of people from India, Africa, and the Caribbean; and you know, not actually being in our own home). My regular routine here is for the most part what I imagine I will do when I retire (and my sister jokes with me that I am like a retired person right now): Taking fitness classes along with a lovely group of regulars at my local health clubs; preparing most of my own, healthy meals; crocheting; reading; going out for specialty coffee; walking outside; writing Yelp reviews; blogging; connecting with friends, family, my students, and colleagues on social media and through texting, phone calls, and video chats; dining out and exploring my surroundings a few times per week (mostly with Aaron, but sometimes solo); catching up on TV shows; practicing Spanish; hanging out with the pets and my husband. Because I thrive in routines, I always seem to find ways to fill my time (which can actually lead to a bit of stress). 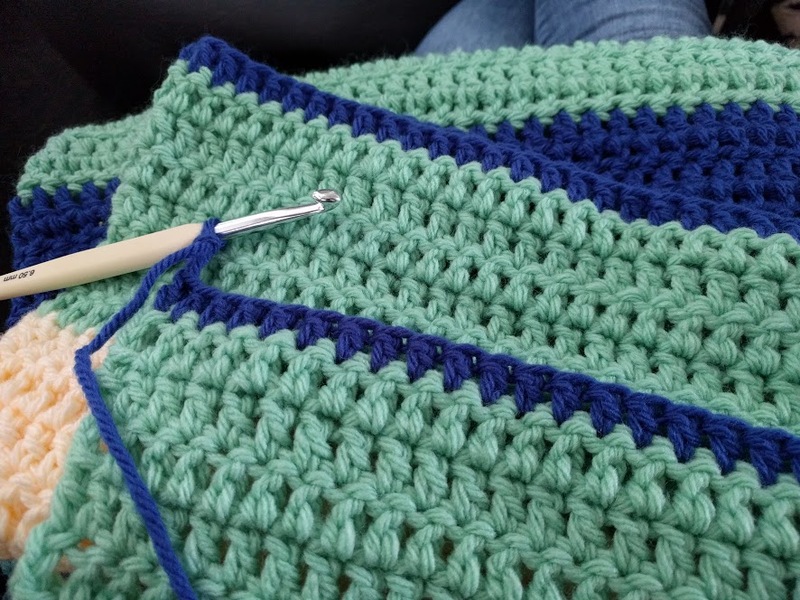 I create lists of to-do items and break down my overall goals into smaller ones (right now it’s get up to my 200th review mark on Yelp before we leave the UK, since I won’t be Yelping again for a period of time; learn how to crochet a new type of stitch most days; post regular content on my social media accounts; keep up with reading at least one fitness-related article and a few news articles every day; exercise most days of the week; etc). I also have a list for things we want to do where we are, like trying certain types of cuisine or restaurants, seeing a show, visiting certain neighborhoods, etc., to make sure we are aware of how much time we have left and are fitting in the activities we prioritize highest so we don’t run out of time and miss our chance, trying to prevent leaving feeling like we missed out on something we didn’t make happen for ourselves. And then I have another list for items I need or things that need to get done before we leave our current location, such as purchasing supplies for the Camino, wrapping up writing on and mailing postcards to friends and family, etc. I’ve gone through periods of time without maintaining these types of lists, and especially when it comes to to-do items regarding future travel planning, I’ve forgotten about and thus let things slip through the cracks (such as not looking into accommodations soon enough, and the prices on rental cars went up, which really upset Aaron because he’d put a lot of advance research into it — it worked out, but it’s better for me personally and for our relationship if I keep these lists going). It feels good to cross or check off items I complete, as I get a sense of accomplishment from doing so, but it can also feel like a daunting endeavor to get to everything on my lists (especially the daily goals). I am making an effort to mindfully practice patience and understanding with myself, and be okay with not getting to everything each day, especially when we don’t spend most of our day at home because we’re out and about (which is also important, to fully experience what is around us in our time here). Overall, the lists help me stay on top of my wants as well as the need-to-get-done tasks that I’m not so excited about. It’s funny, but even in the absence of a full-time job plus my fitness endeavors on top of it that take endless extra hours to do well, I’ve realized there still aren’t enough hours in the day to do everything I want to do (at least not an ample amount of time to do everything quite at the level I would like to)! Admittedly, feeling like I need to be blogging more often than I am, and realizing how much time it actually takes, how much detail goes into it, how much more I have to cover, feels like an overwhelming burden weighing down on me. 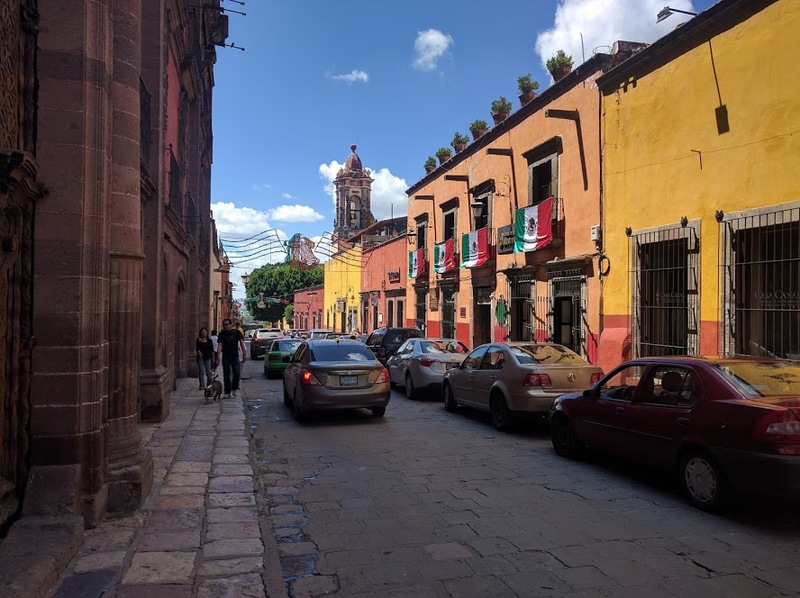 I want to have comprehensive content out there to share our authentic experiences from everywhere we’ve visited, and I’m not capable of merely summarizing because that’s not the point, for me, of this blog. I would rather take my time to thoroughly share all the details I can dump from my memory through my fingers on the keyboard and into the computer screen, even if I’m still documenting our experiences from this journey a year from now, than just share a few major highlights from each destination and be done with it. So I’m learning to be okay with the fact that I’m not “caught up” and that one blog post may take weeks, or even months, to write, edit, and publish. Aaron suggested writing a little bit each day, even just half an hour, and I’ve been actively working on this goal while I have so much down time and opportunity to while we are in the London area. Now, it still doesn’t happen every day, but the intention to get to it is there, and I do end up contributing to this and/or another post I’m working on most days of the week. I’m disappointed that I haven’t been able to keep up with it more throughout our travels, but I understand the whys and I realize now (though Aaron did share his thoughts about this early on, and I admit was right) that I set up an unrealistic expectation for myself to stay current with what is happening in real-time, based on how I write. That expectation has caused me to feel stressed and like I’m always behind, like I need to try to catch up, and I suppose that’s an unfair and unnecessary burden I’ve placed upon myself arbitrarily. Overall, I know how much our family, especially, and friends appreciate the detail described and being able to feel like they were right there with us, no matter when our experiences were actually documented (i.e. how much time has passed since they happened). I know my approach to writing provides them with a new, deeper understanding for what it was exactly that happened during that time for us beyond what we’ve verbally shared already. Also, I personally want this candid level of detail for us to reflect upon ourselves in years to come as our more specific memories fade and greater amounts of time pass, the distance between the present and our prior, epic long-term travel adventure inevitably growing further apart. As strange as it is to realize while in this moment — still in the midst of our journey, after spending over a year away from home and with several months on the road still ahead of us, when long-term, independent travel is our lifestyle — one day this will all remain a fond memory of a time that felt like it lasted so long when it happened, but that was really so short when considered in the bigger picture of our lives together. If you’ve made it this far in reading my post, you must genuinely care about how we’re doing and what we’ve experienced and taken away from our long-term travel journey, so thank you for taking the time! 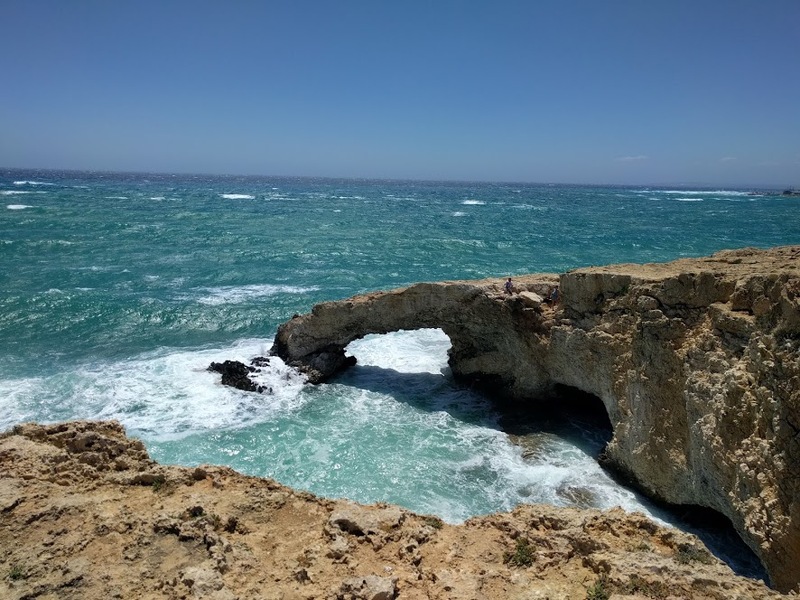 If you’re thinking about doing something similar to what we have over the past year, I hope the information in this post helps you in planning and preparing for the realities of your own long-term travel journey. If you’re wanting to experience some of what we have but on a shorter itinerary, hopefully what I’ve shared has provided some further insight and resources for you to look into to make it happen! I’ve opened myself up considerably through my blog and social media posts leading up to, and throughout, our travels. At home, I’m much more guarded and private about my life, keeping my close friends and family in “the know” on a more candid and deeper, personal level (which is interesting to because I remember being so trusting and like an open book beyond my inner circle when I was developing in my younger years). Over the past year or so, I really feel like I’ve put myself out there and exposed so much for those outside of my more intimate circle to know about. But I think the lifestyle we’re living is so different that many are curious about it upon hearing what it is exactly that we’ve chosen to do, and I want to provide a realistic picture of that for people to keep up with, learn more about, and (hopefully) understand. It also serves as a social outlet for me, providing a sense of being connected to a community of support while moving from place-to-place regularly and being physically far away from the relationships I maintain back at home. It feels nice when friends, former coworkers, acquaintances, my students, people whom I haven’t seen or caught up with in years alike, tell me they are enjoying following our travels, or merely just “like” or comment on my posts. It encourages me and makes me want to continue sharing! I hope to inspire others to take an honest, receptive look at their own lives and listen to what they’re noticing, especially when it comes to a desire to make a change and take a leap of faith for something that is important to them, and figure out how to make it happen! I can fully attest from my own experience that the journey is personally rewarding one to go on and is worth it, however it turns out! We realize moving back home will be an adjustment as we reintegrate into the ways of American society and more a “normal” lifestyle. Resuming the usuals of “adulting”, such as vehicle registrations, insurance, utility bills, our careers; renting a place of our own that we customize and truly live in and maintain for a prolonged period of time; immersing ourselves in our local community with fresh perspectives and mindsets as we begin the next chapter in our lives in building the long-term lifestyle we want for ourselves; getting to see our friends and family more regularly again. Having an understanding and appreciation for it all that experiencing what we have offers as a result. I remember feeling sick of the same routine and wanting to escape from it by going on this adventure; well, I’ve gone on it and will be ready to have a different routine, though similar and familiar in some ways, when the time comes. I feel excited when I think about ways to become more involved in and connected to our own community back home, and pursuing health and fitness industry opportunities with an open schedule to fill up! We hope, and will make concerted efforts, to maintain more minimalist ways of living when we return back to our “stuff” sitting at my grandparents’ house in Fresno waiting for us, and when choosing to accumulate more over time in the future. We downsized so much before leaving last August, but in reviewing what we now have in our minds today, we feel committed to going through it again and letting go of even a bit more. Not only will this make our relocation back to Sacramento easier, but it just feels good and is a basic start to our next step that is in alignment with the general philosophy of how we’ve lived over the past year (though, of course, we recognize we’ll no longer be living out of backpacks, and at least I can say for myself, there are certain “things” I am looking forward to enjoying again, such as my blowdryer and flat iron, certain clothing items and accessories, and my variety of fitness equipment)! We’ve always prioritized experiences over tangible items together as a couple, so we anticipate that will continue without a hitch. I truly feel like we’re better, more well-rounded people because of our long-term travel journey, and its effects will spill over into many other areas of our lives in the years to come. We hope to offer the same kindness and hospitality to visitors in our own home, city, state, and country whenever the opportunity presents itself. It’s as simple as if someone passing us by on the street is lost and asks for help finding their way, taking the time to offer our assistance by doing our best to direct them. Whether people we’ve met in our travels come for a visit or our own family and friends spend the night, we will make efforts to treat our guests as we would want to be treated and make them feel at home, and in many cases, treat them how we ourselves were treated when we were in their shoes for such a prolonged period of time. So, what’s next? From here, we look forward to joining my in-laws (Aaron’s parents) in Ireland next week! This will be the first time anyone from home has come to meet us somewhere in our travels. We’re excited to see them and hang out in the countryside for a couple of weeks before flying to Paris, where we’ll spend a week in France making our way overland to the start of the Camino! We’re still open and receptive to what’s ahead as our long-term independent travel journey continues and you can bet we’ll be sharing the details! Now that you’ve heard some of the backstories behind them, here are some of my favorite picturesque landscapes of our travels that I haven’t already shared within this blog post. Enjoy! 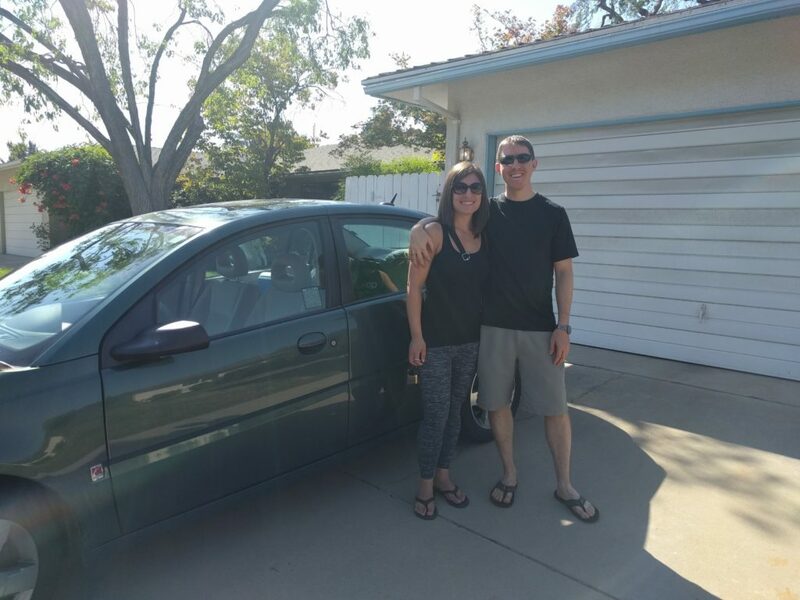 2 Responses to "Major Milestone Reached: 12 Months On The Road"